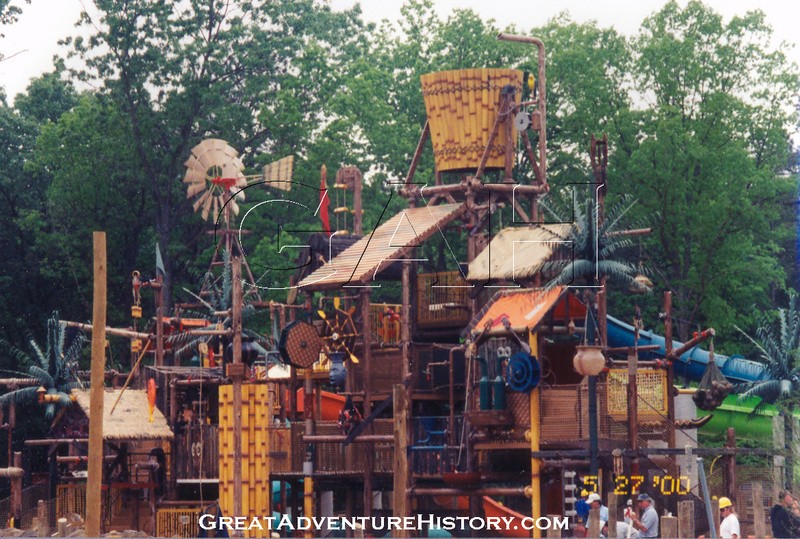 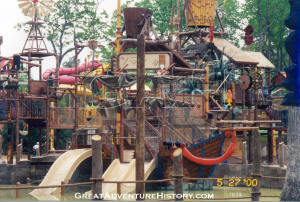 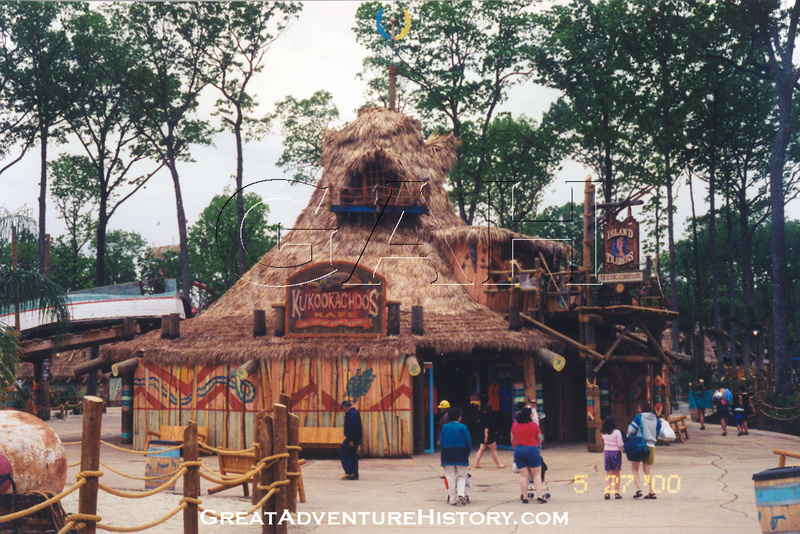 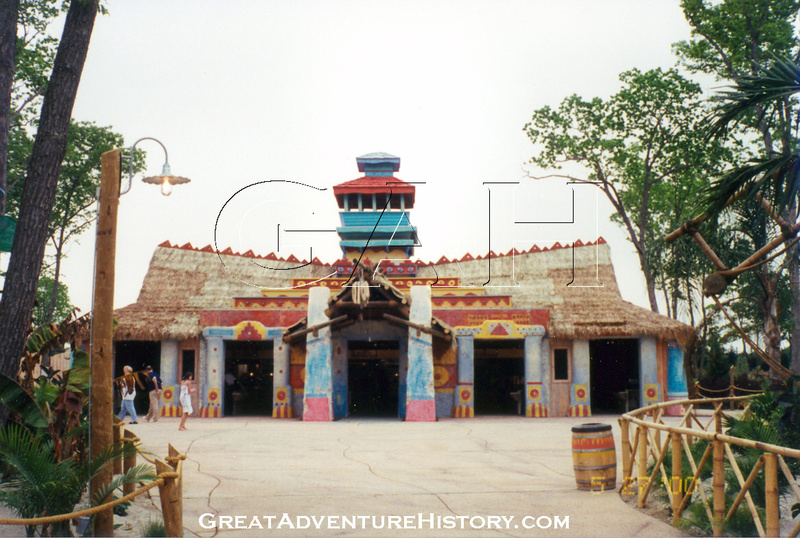 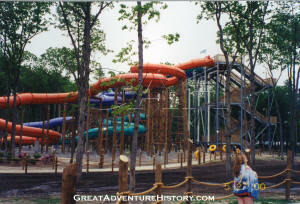 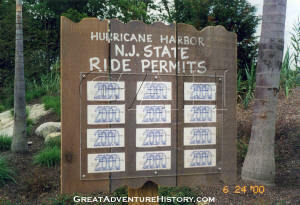 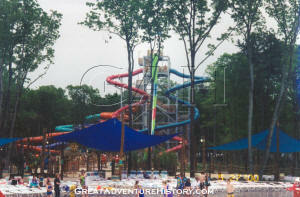 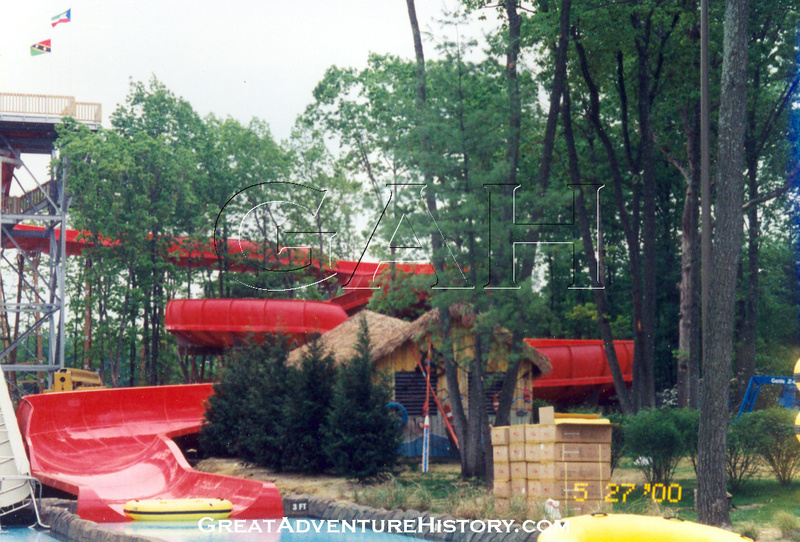 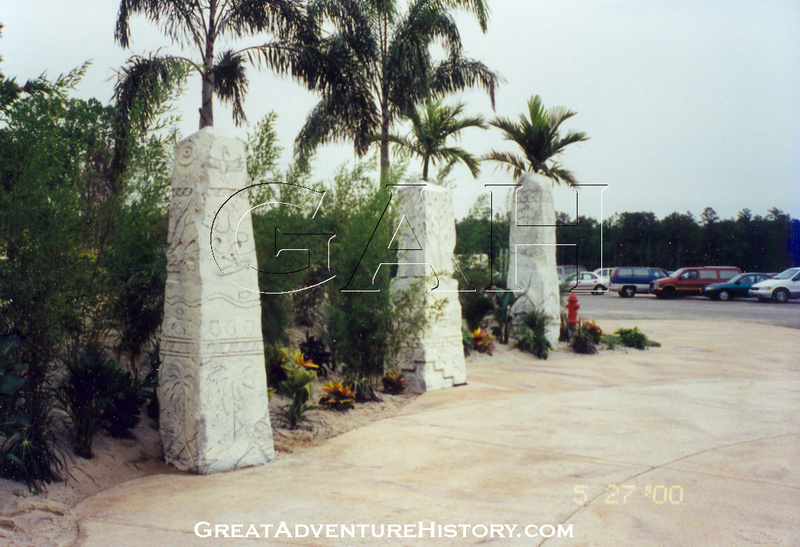 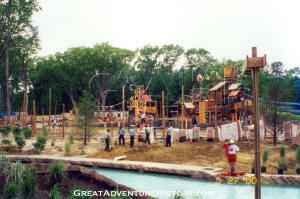 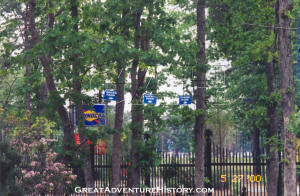 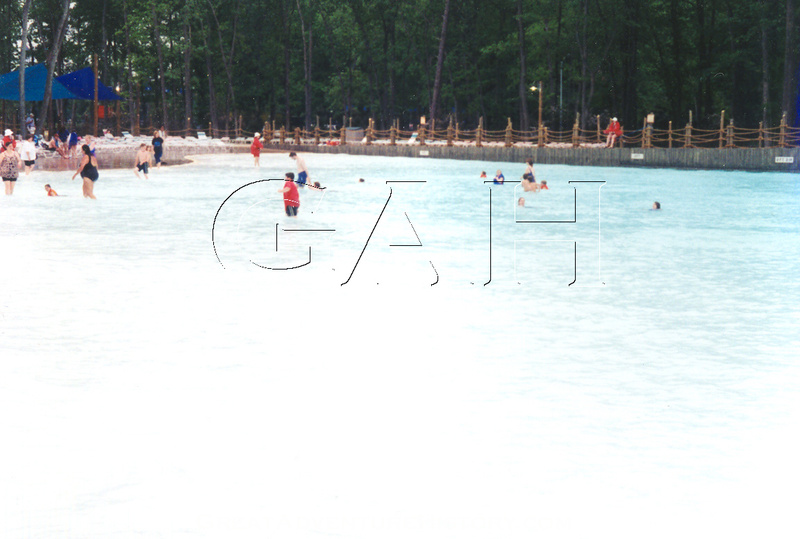 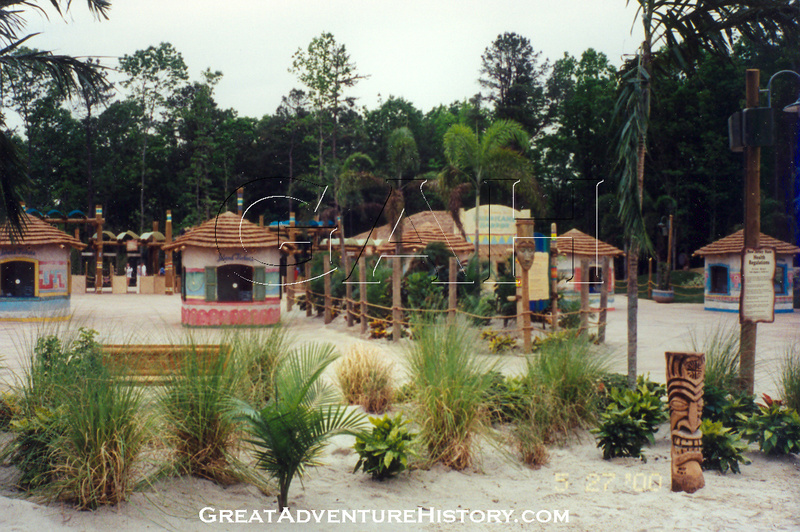 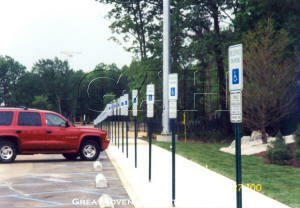 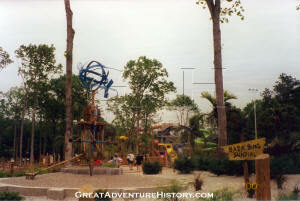 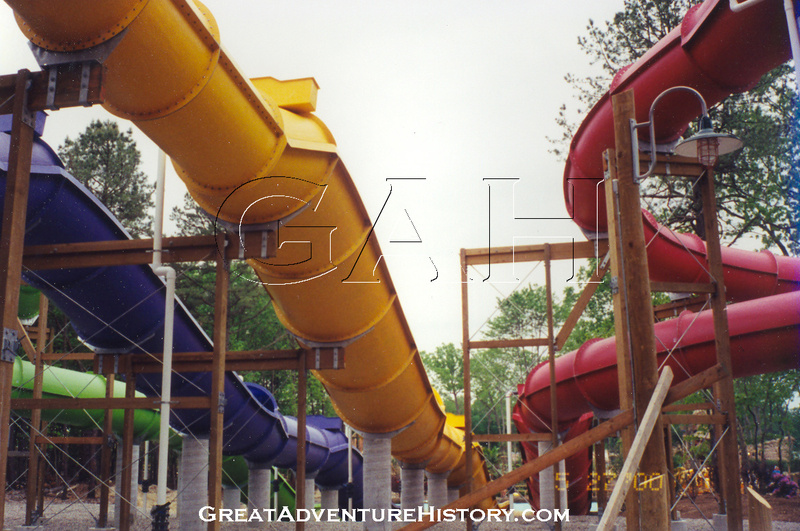 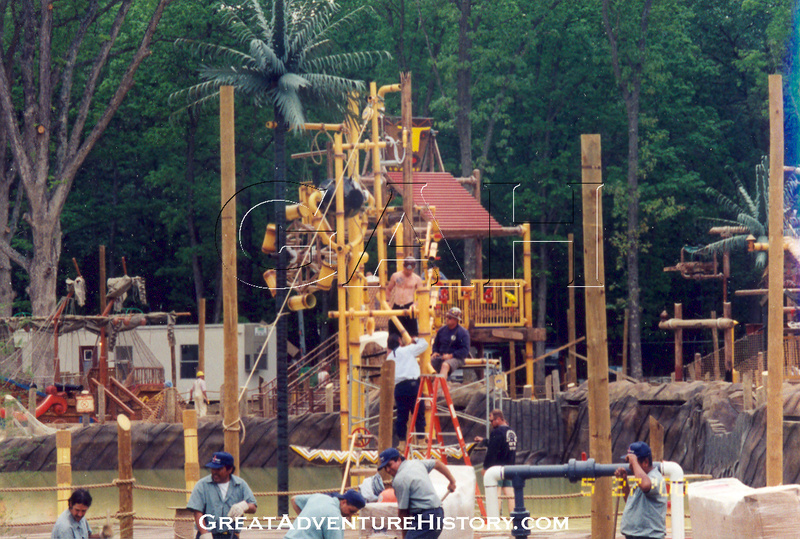 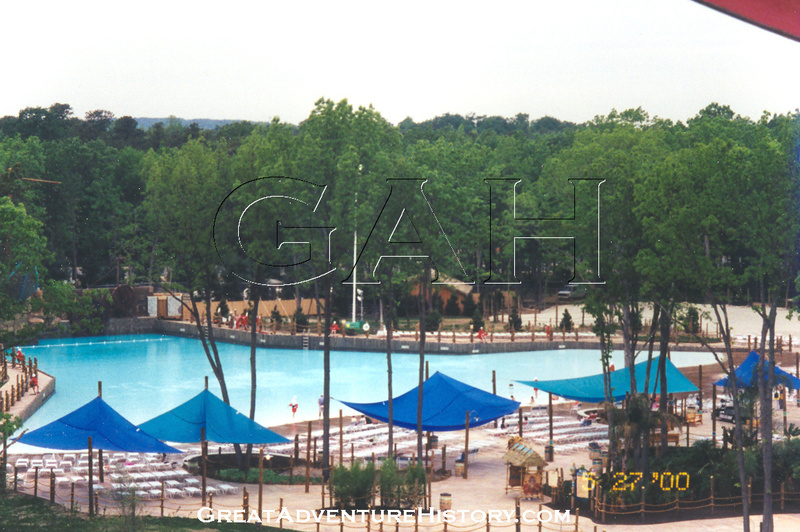 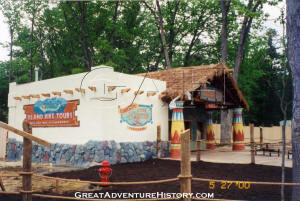 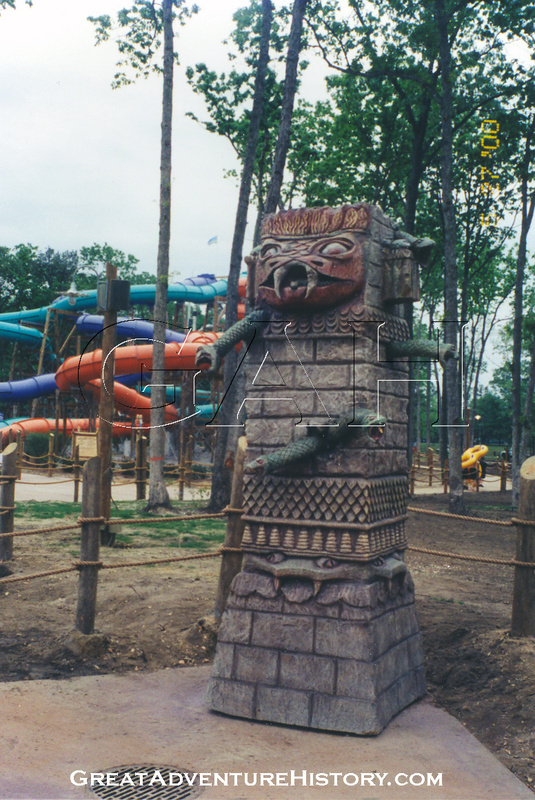 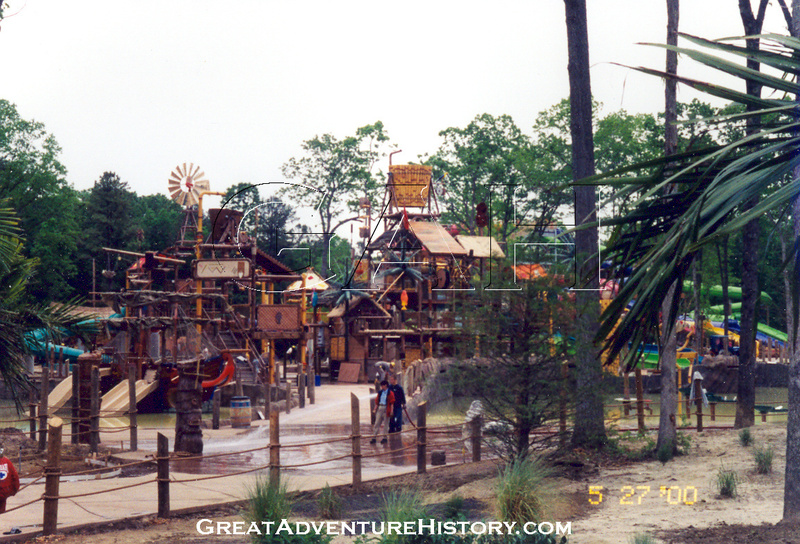 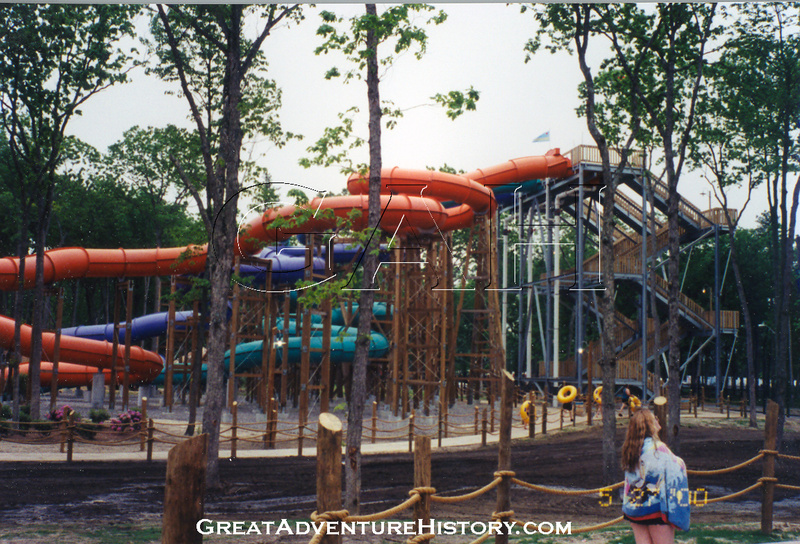 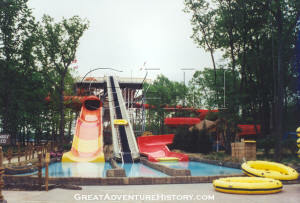 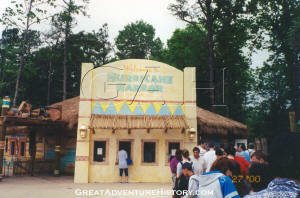 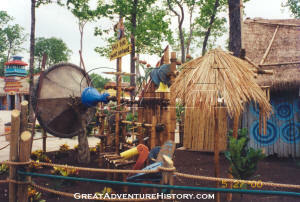 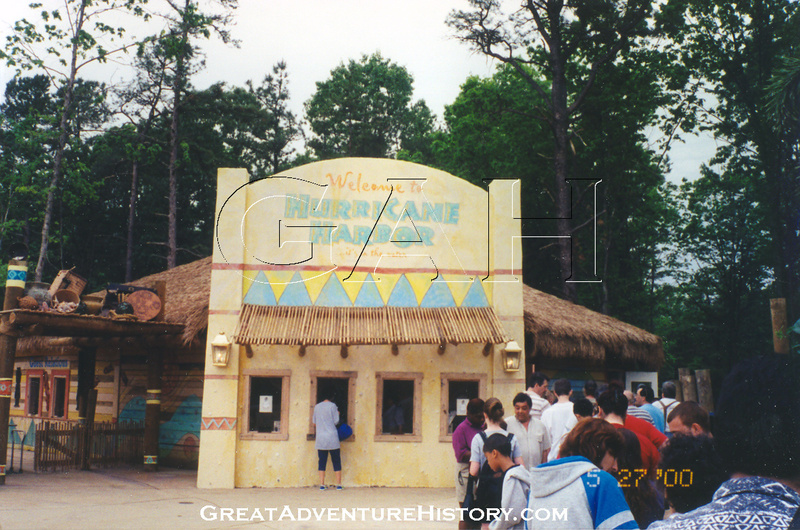 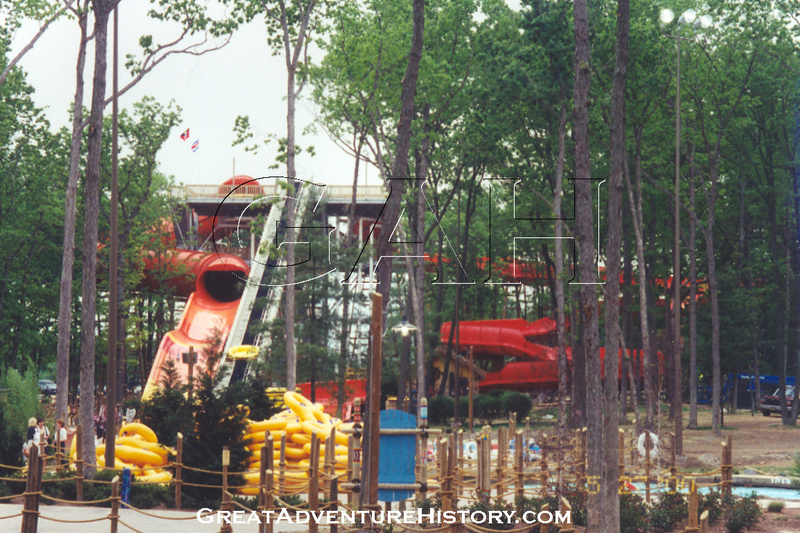 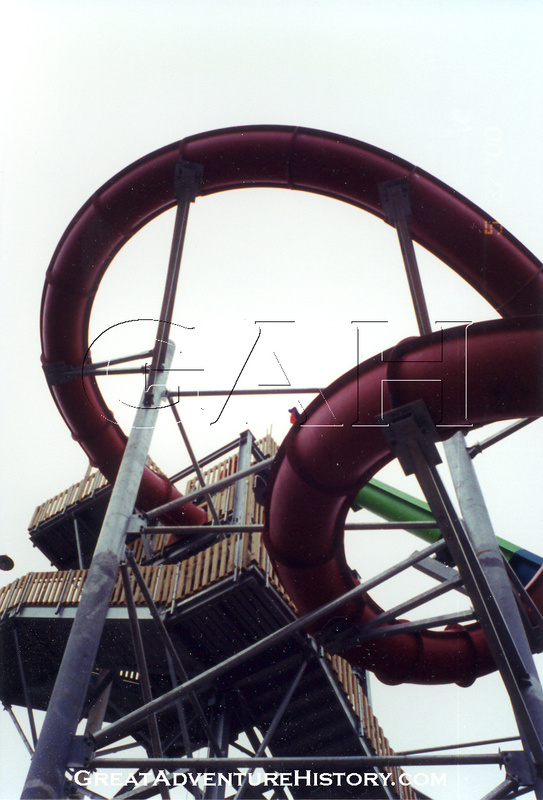 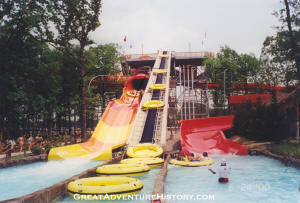 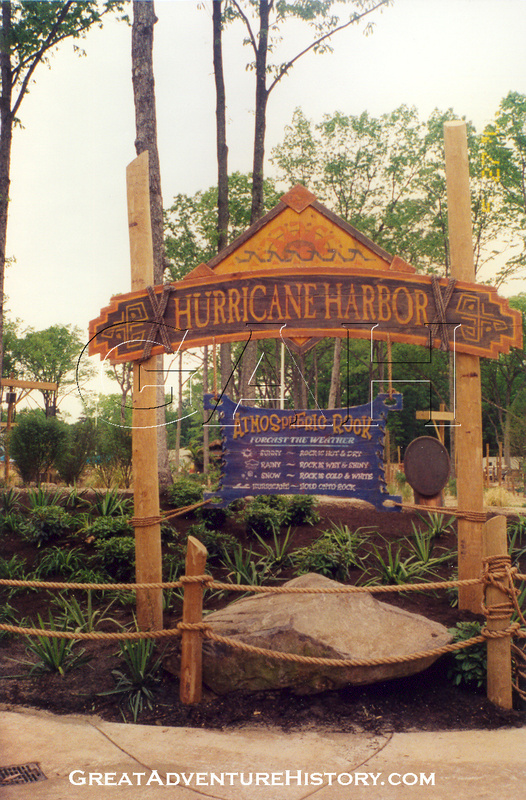 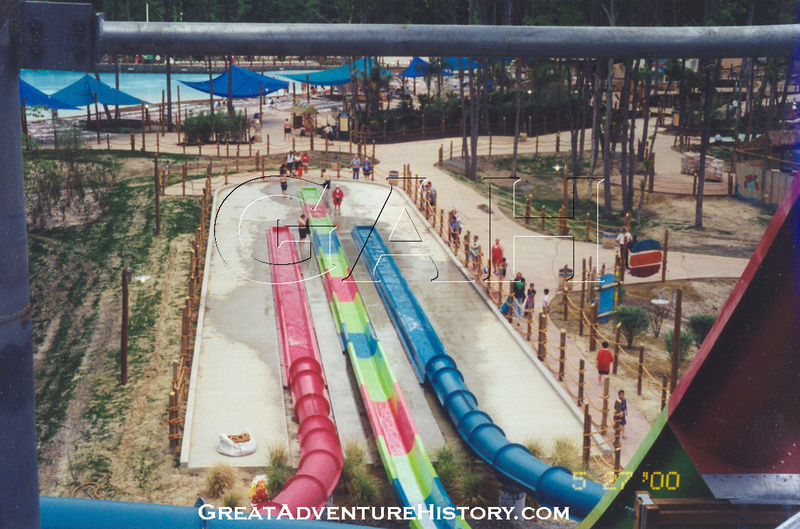 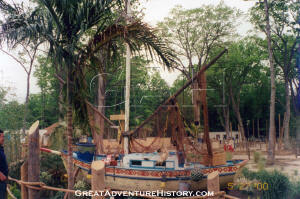 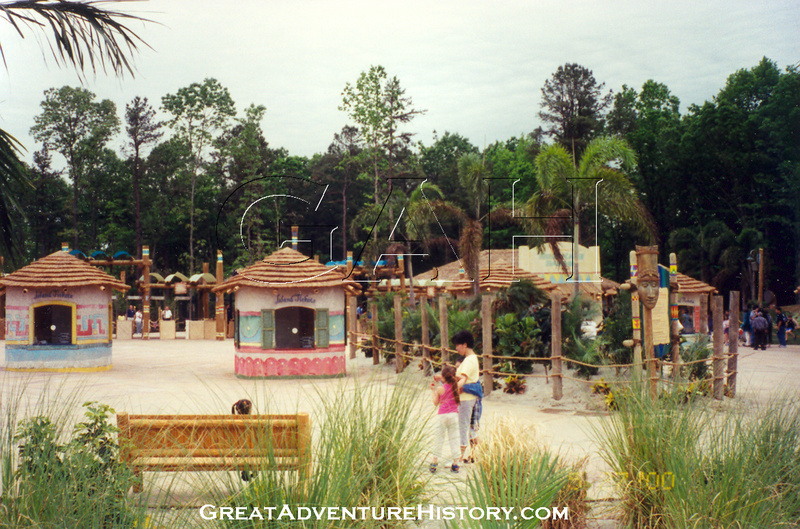 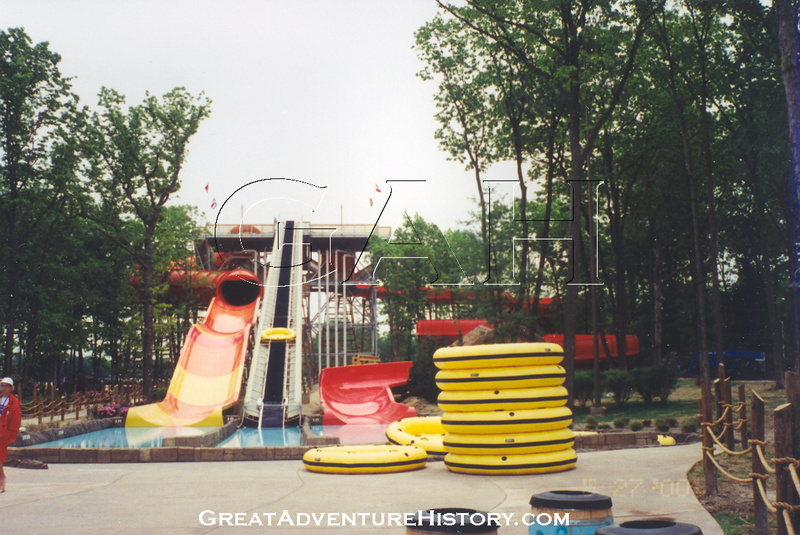 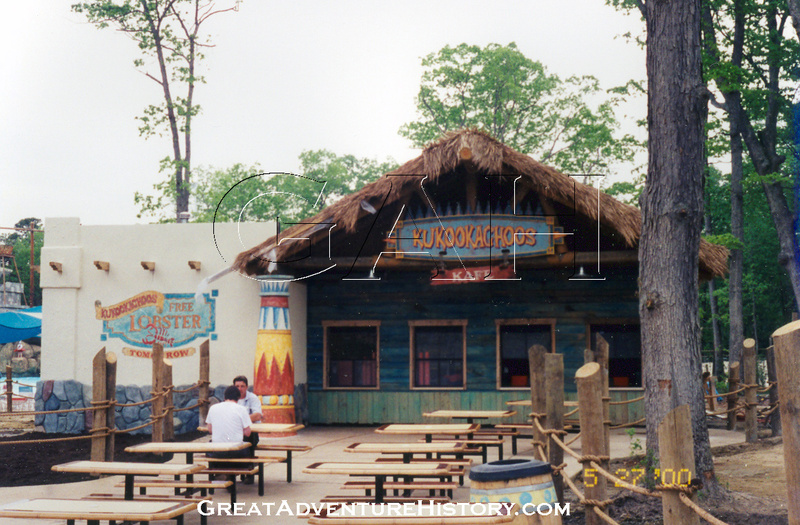 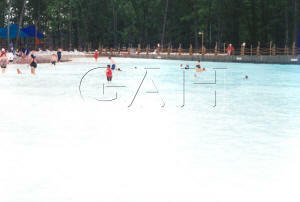 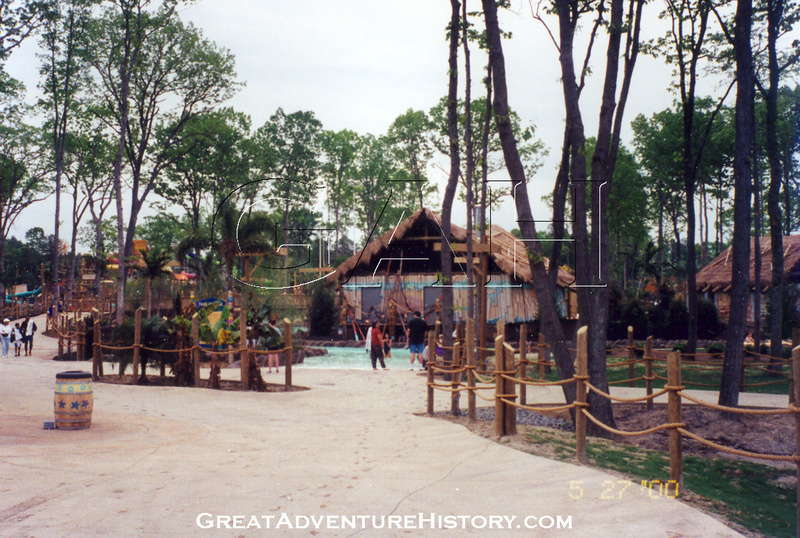 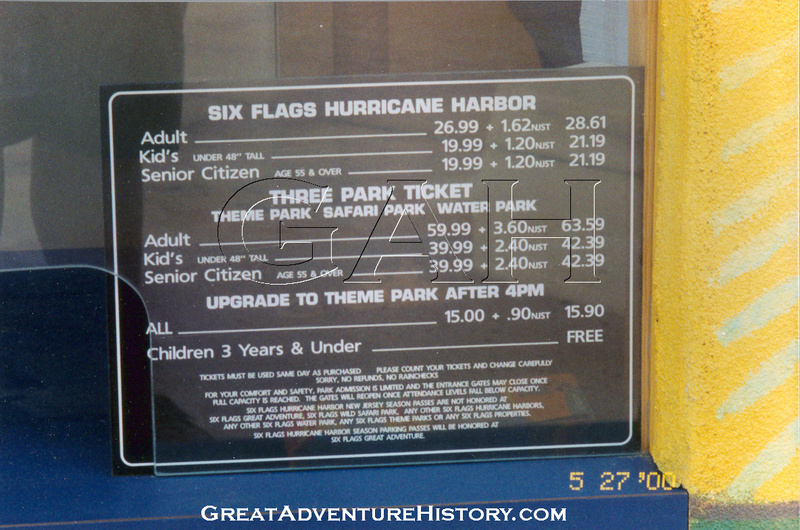 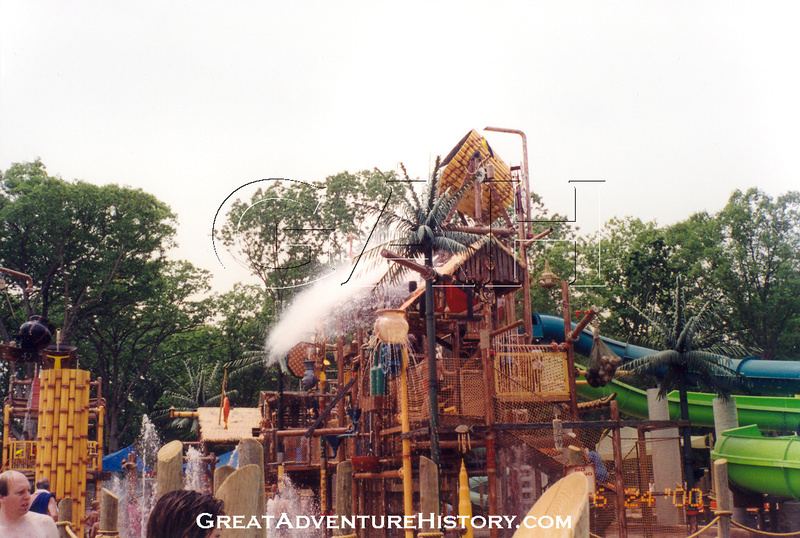 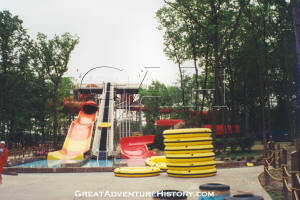 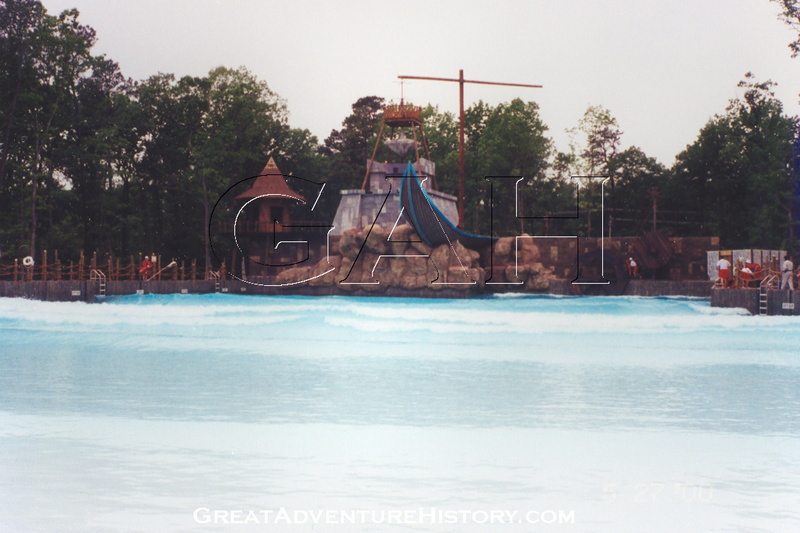 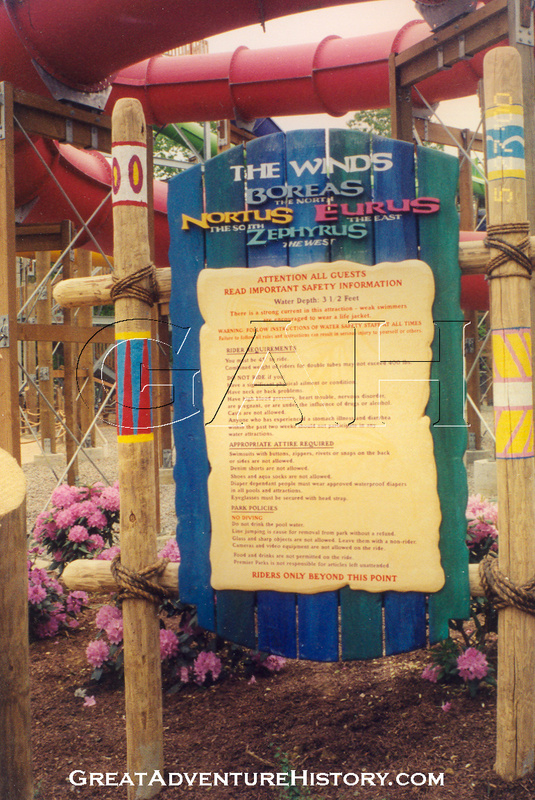 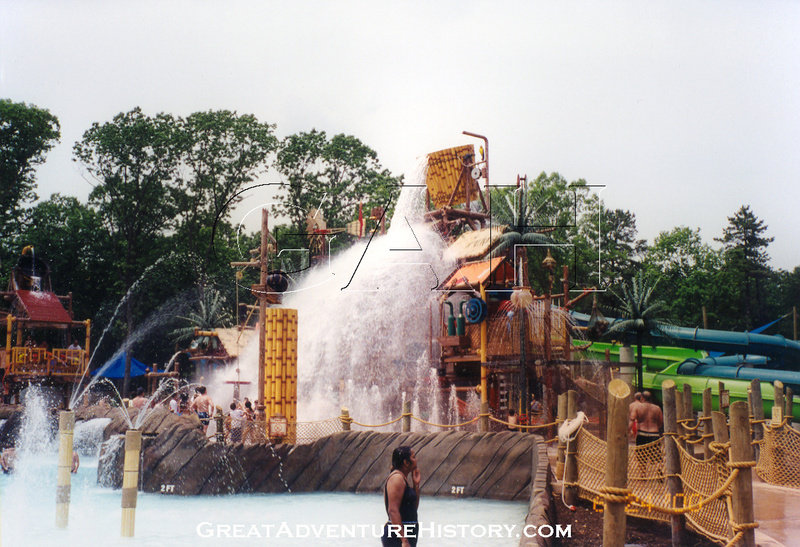 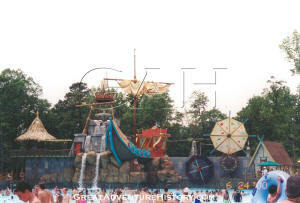 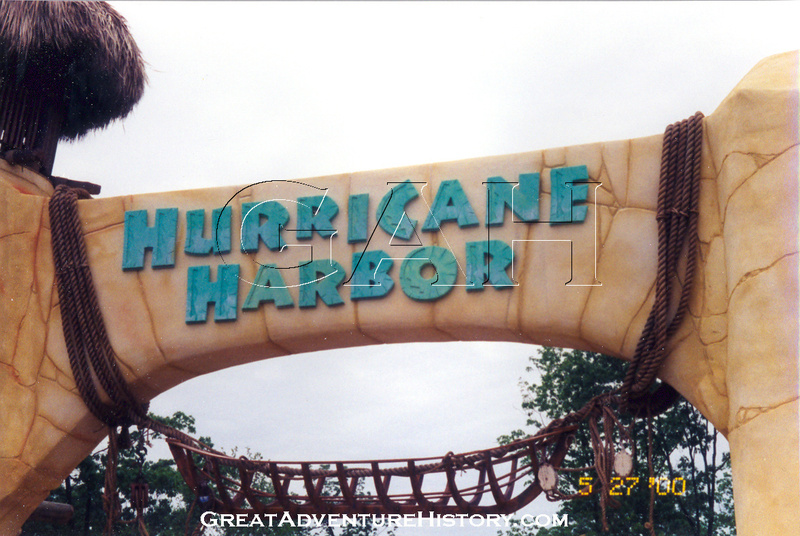 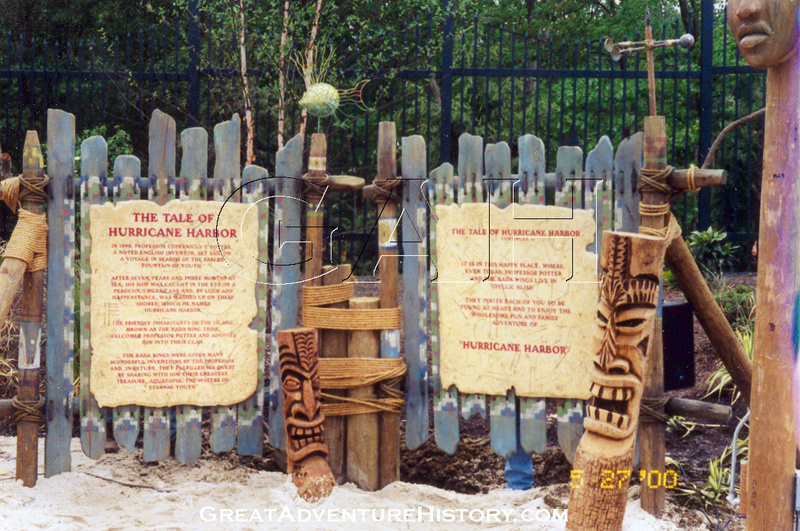 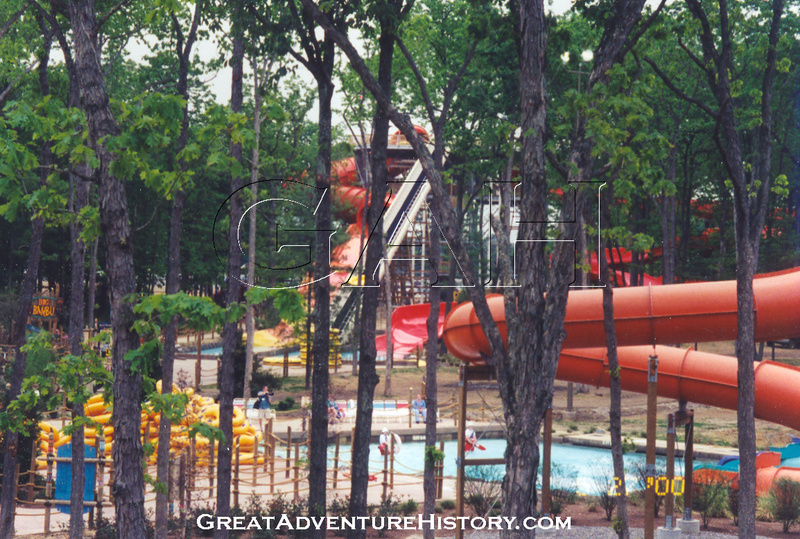 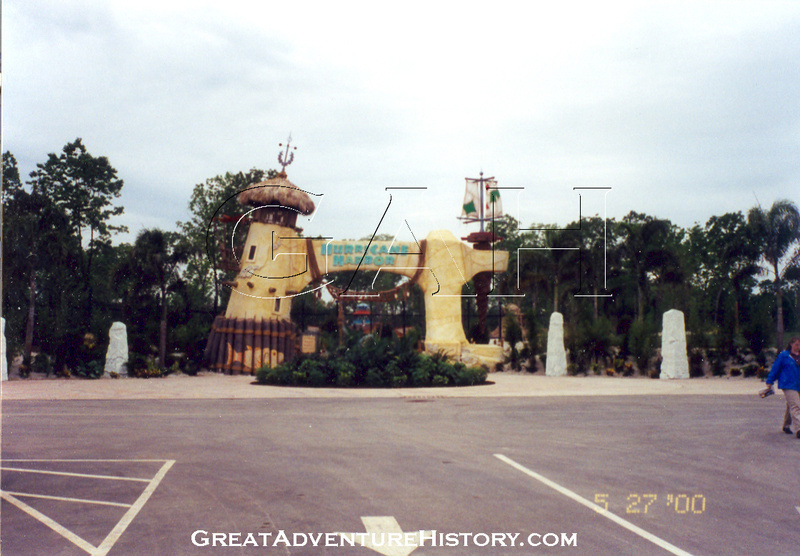 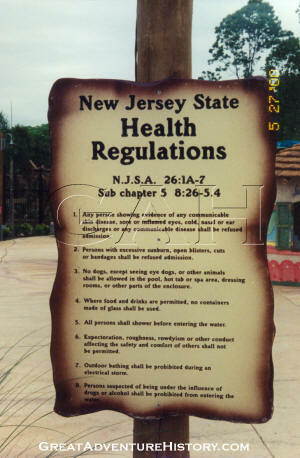 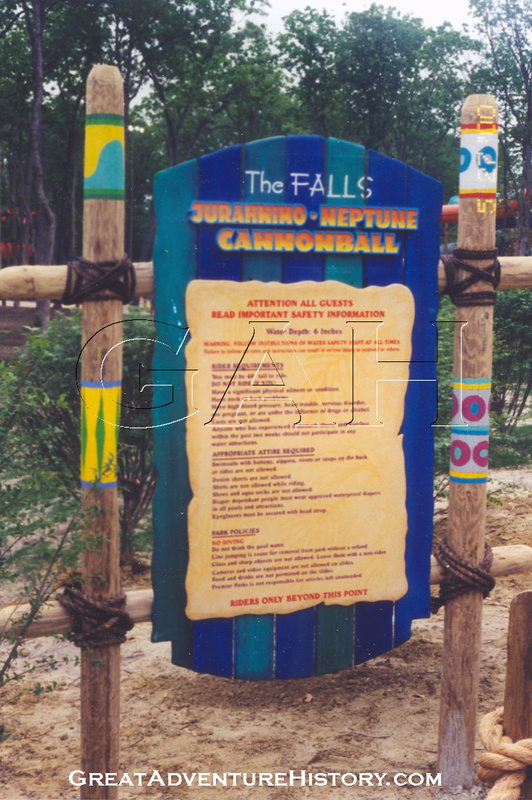 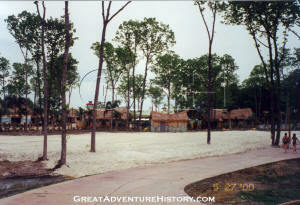 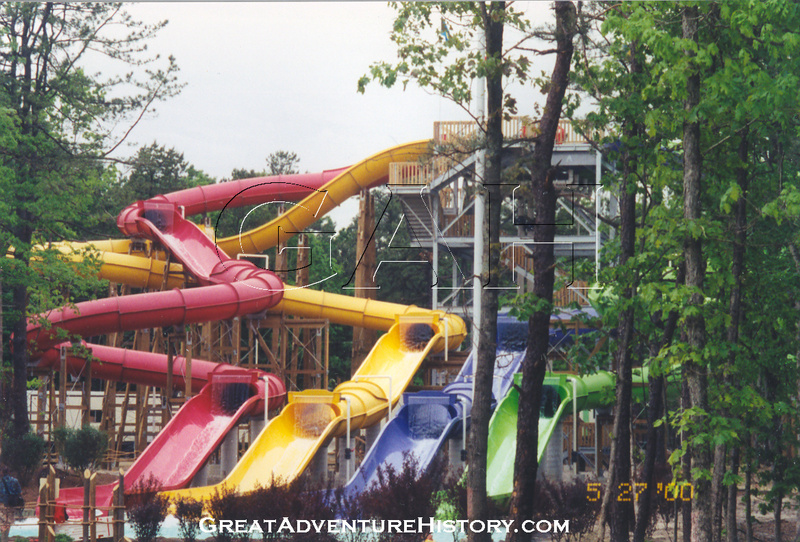 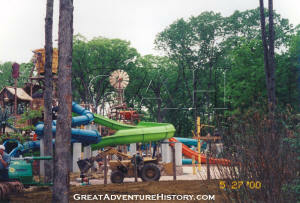 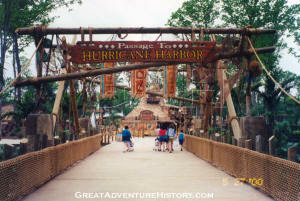 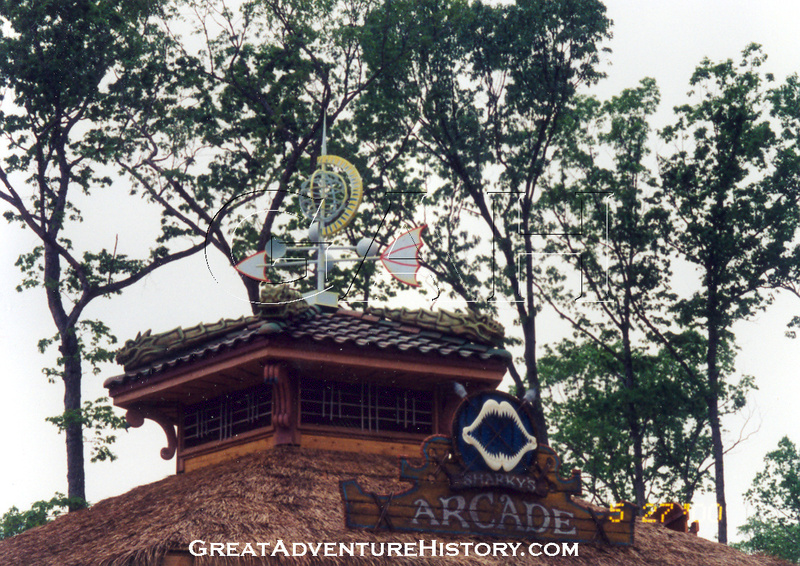 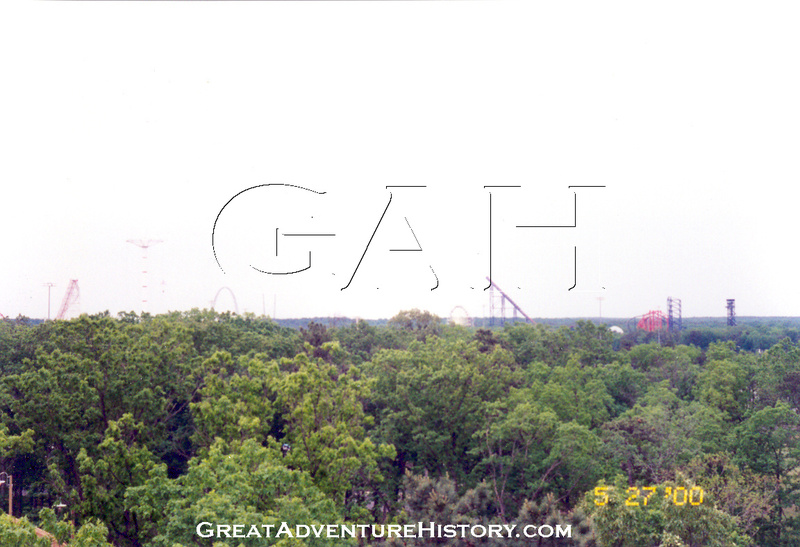 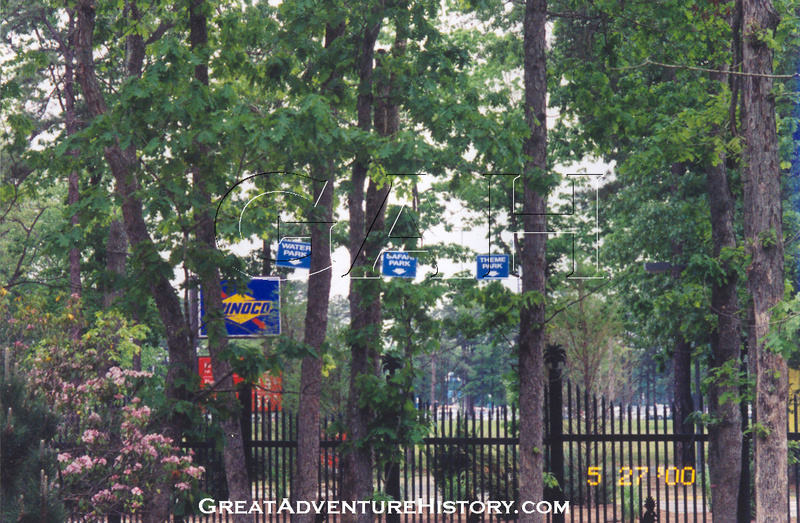 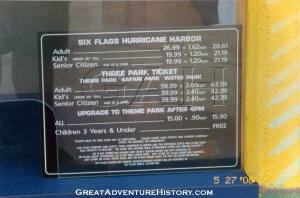 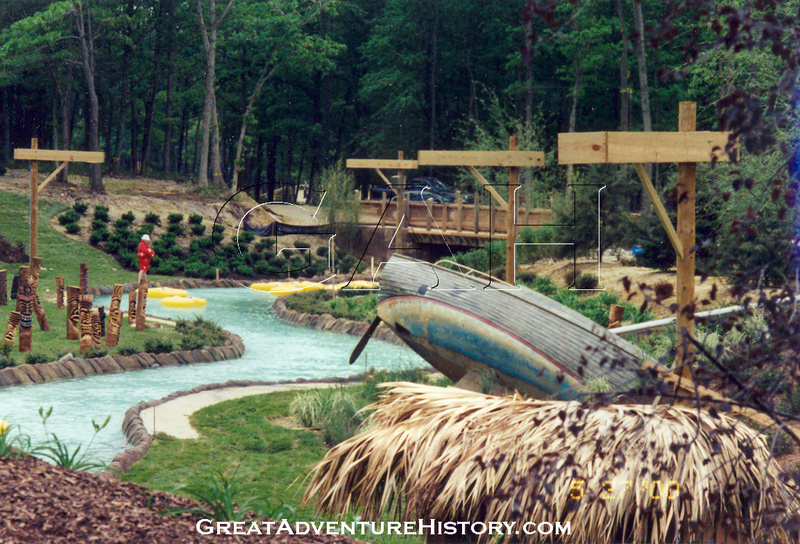 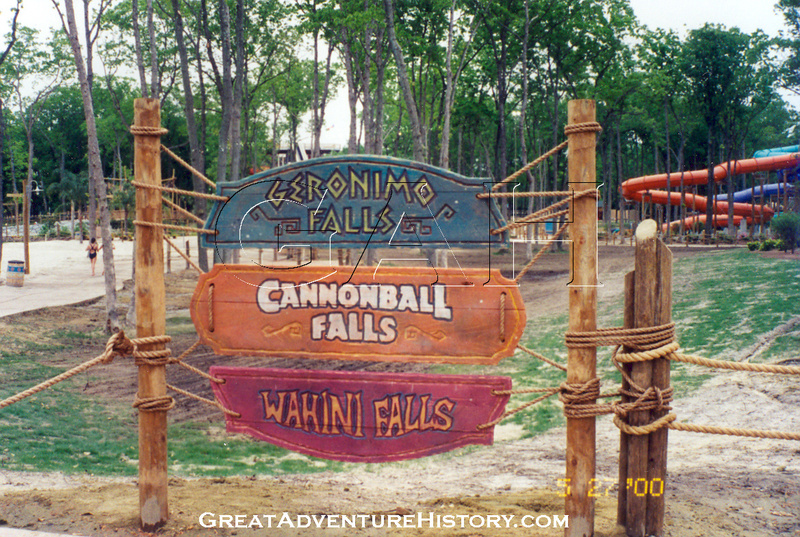 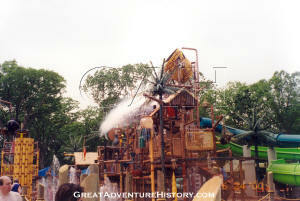 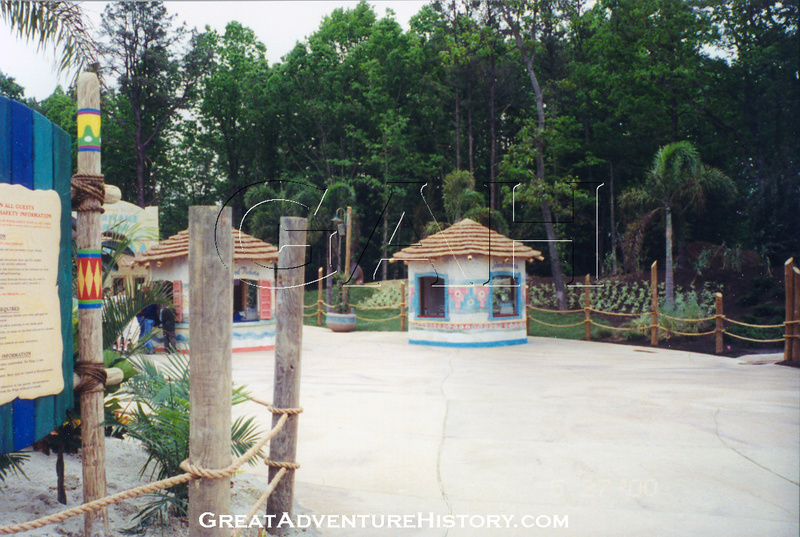 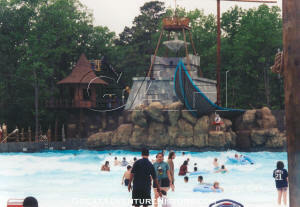 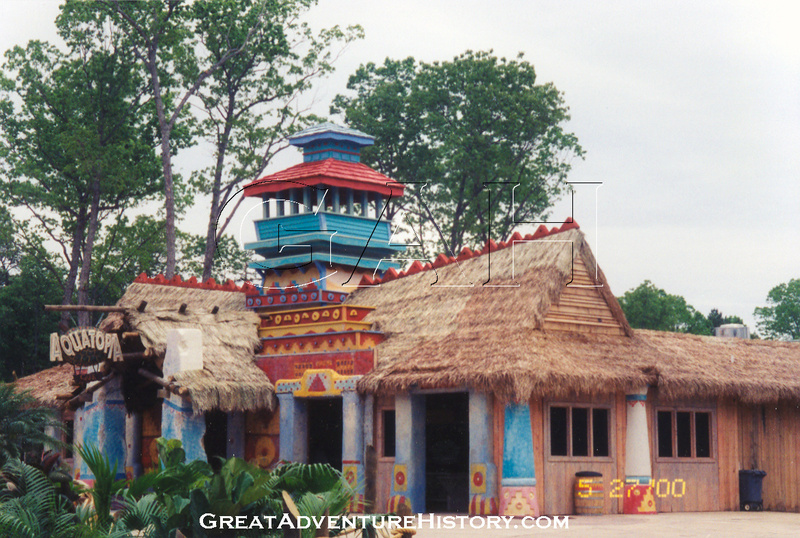 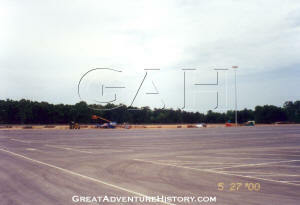 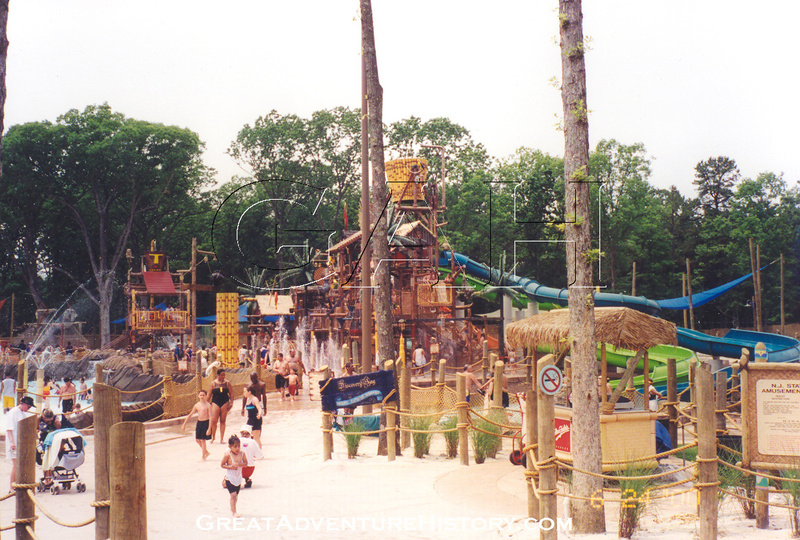 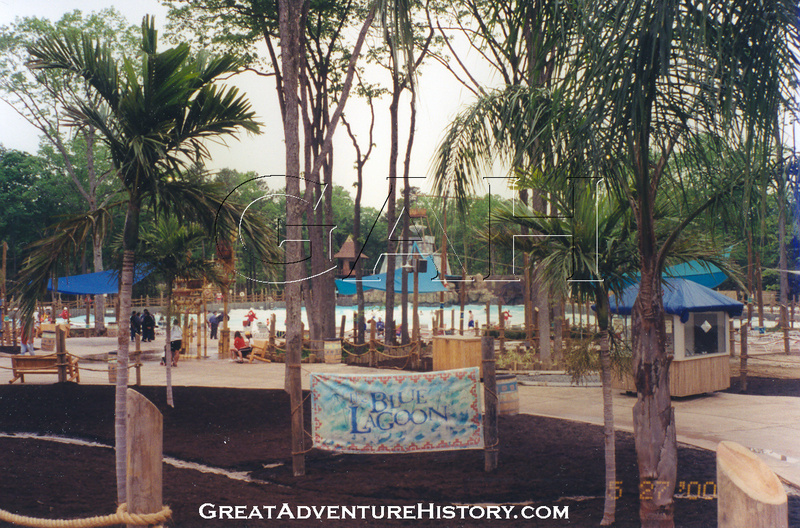 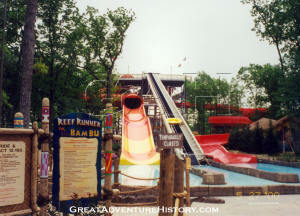 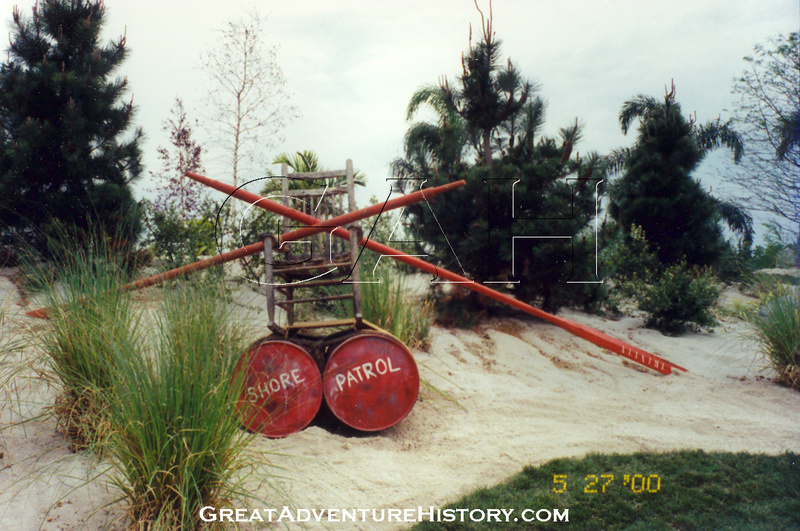 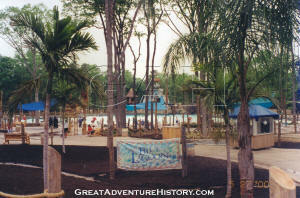 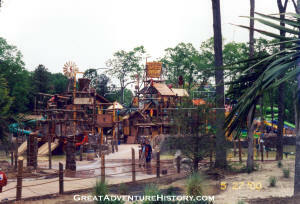 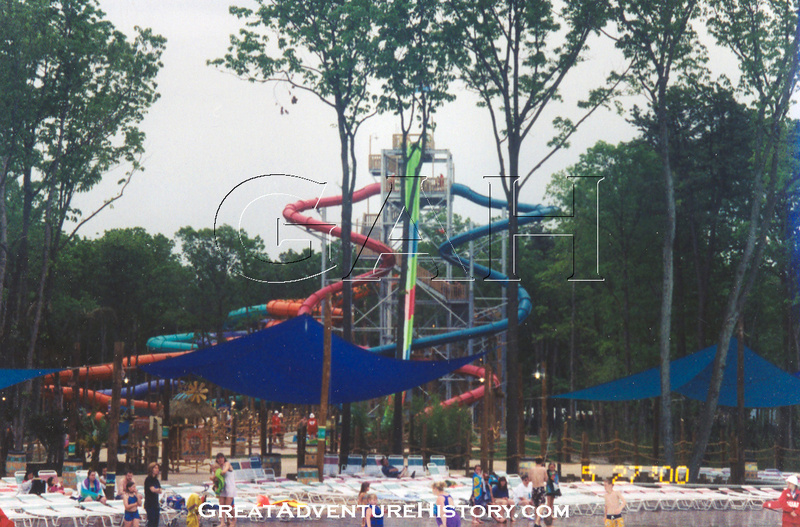 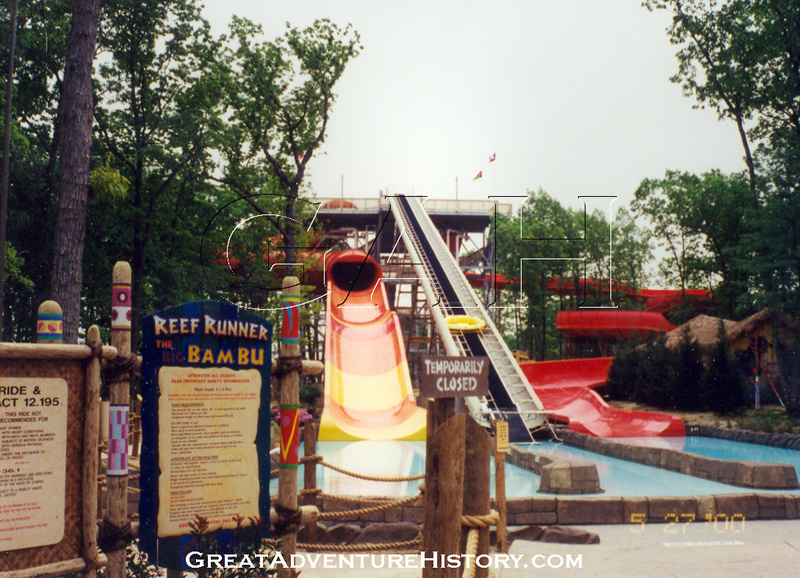 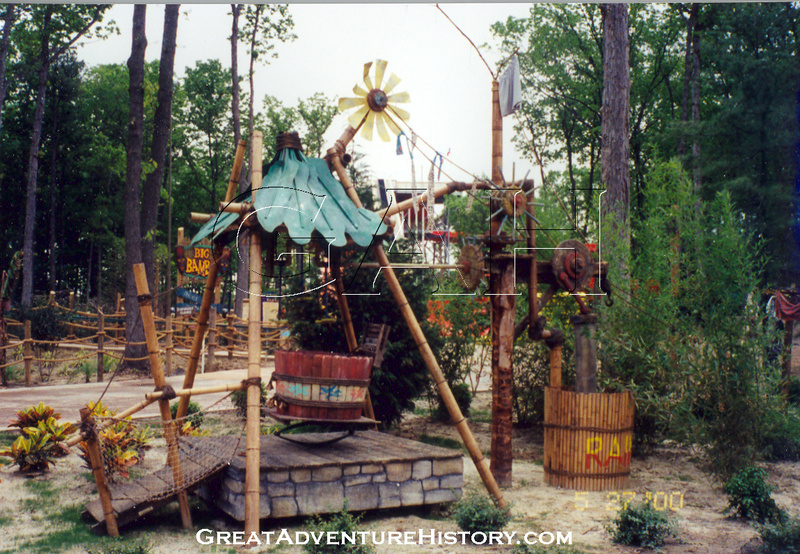 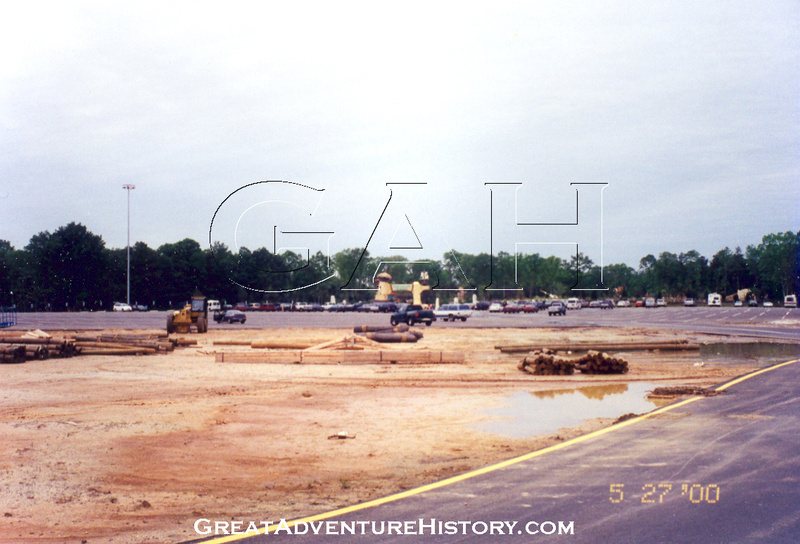 With the arrival of Memorial Day at the end of May 2000 came the grand opening of Six Flags Hurricane Harbor. 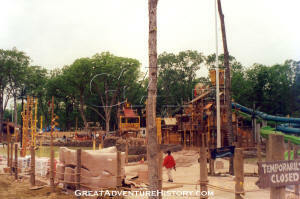 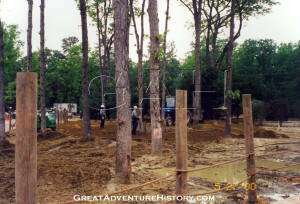 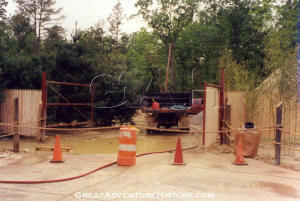 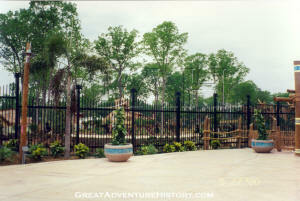 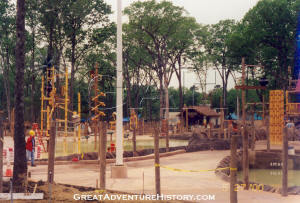 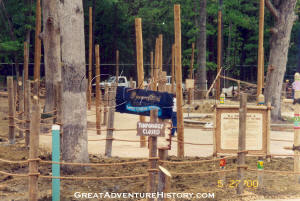 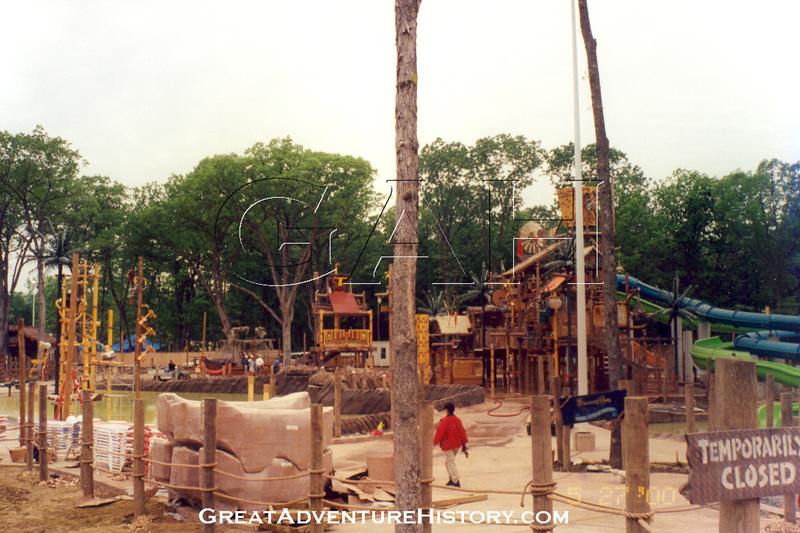 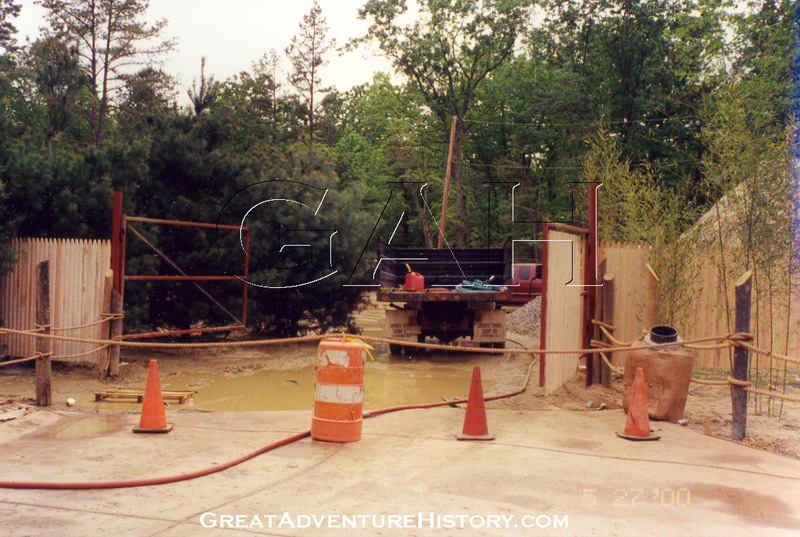 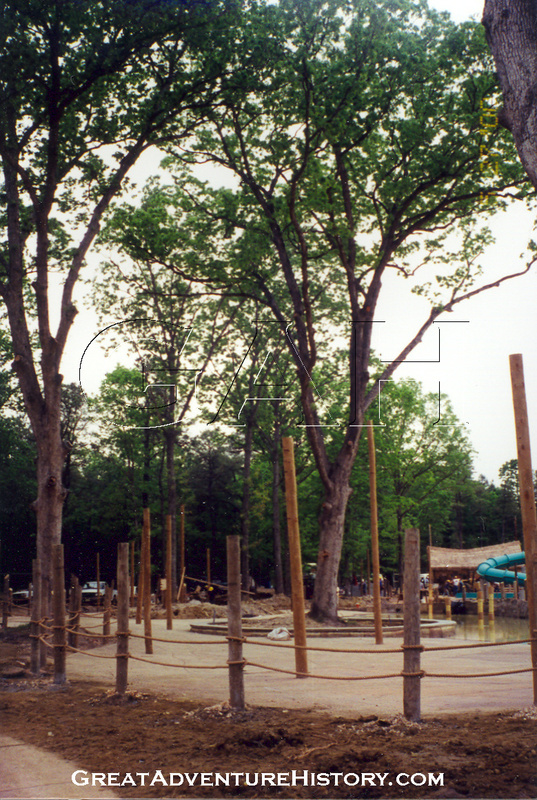 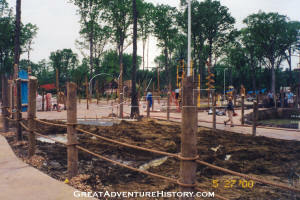 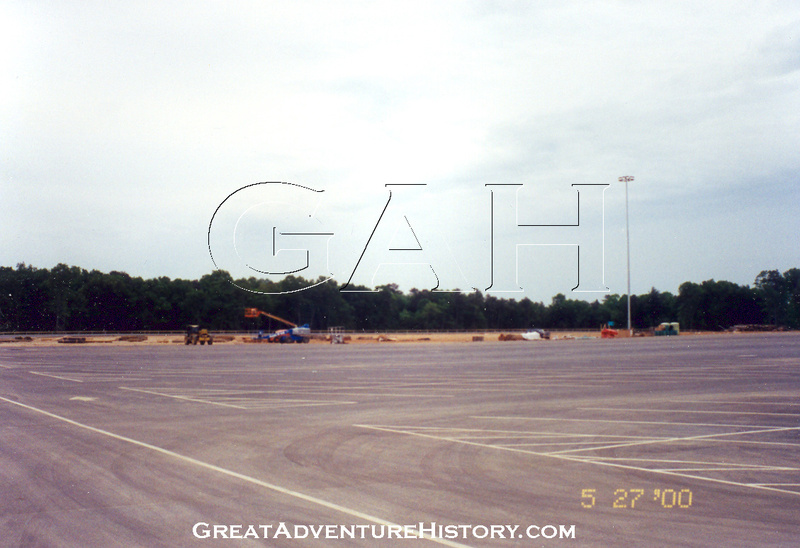 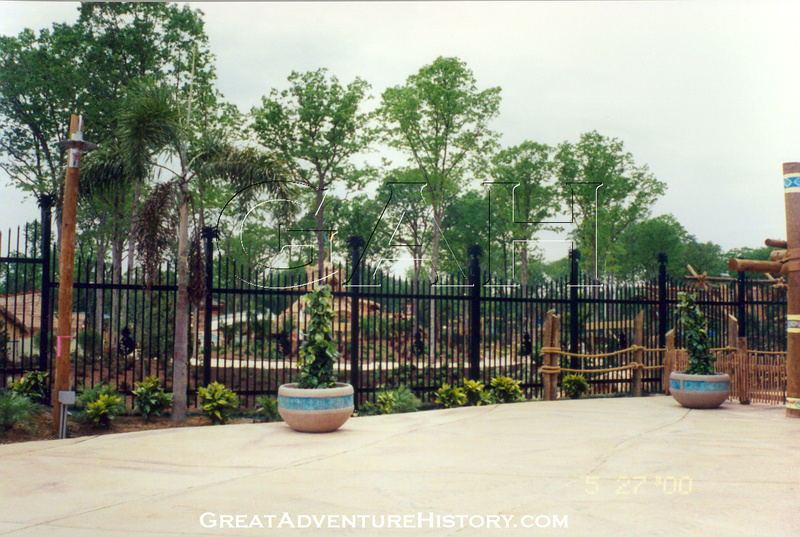 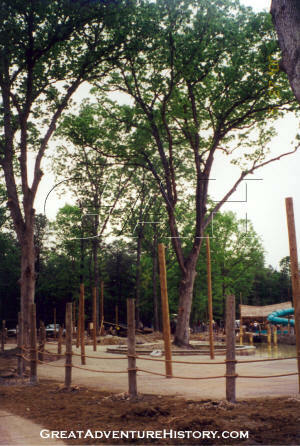 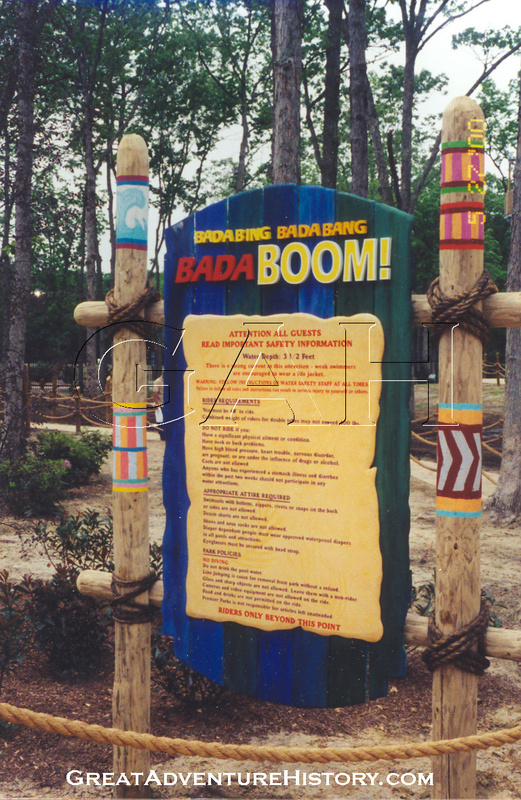 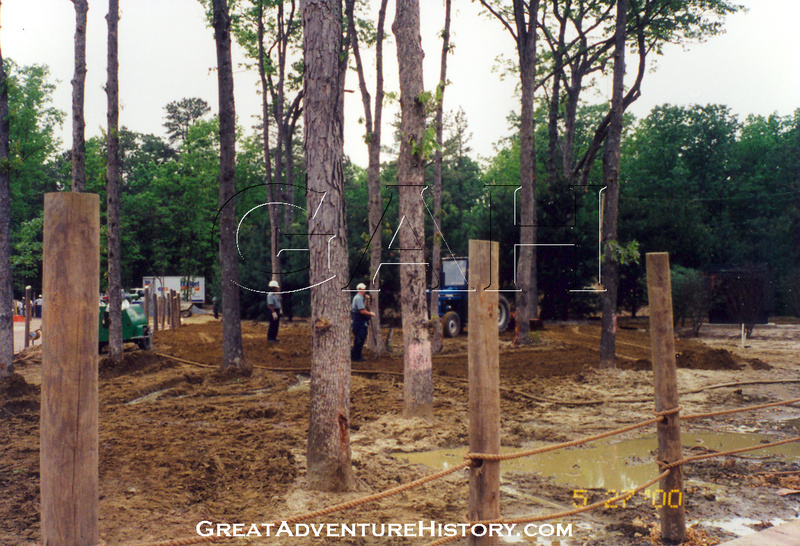 The park was not quite fully ready, with several attractions still under construction while guests enjoyed the ones that were ready. 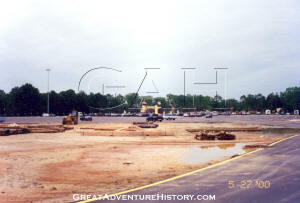 The parking lot was still a work in progress with the areas destined to be left grassy still being large mud puddles. 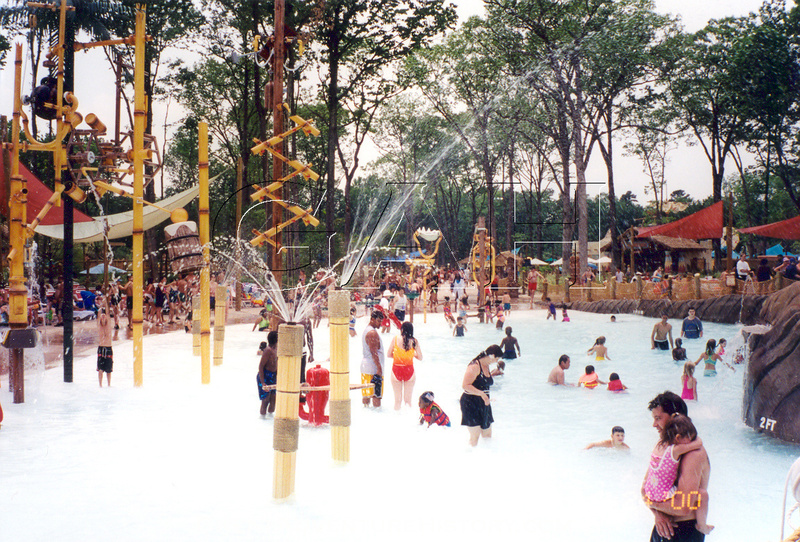 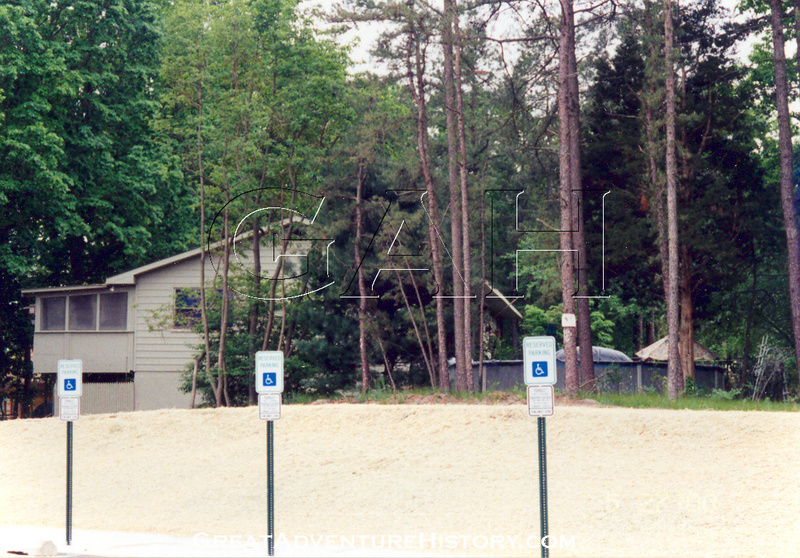 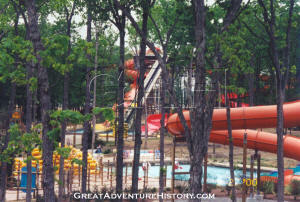 The Hurricane Harbor waterpark was built on the edge of the park property, and the neighboring property which was used as a paintball field was now visible to the park's guests. 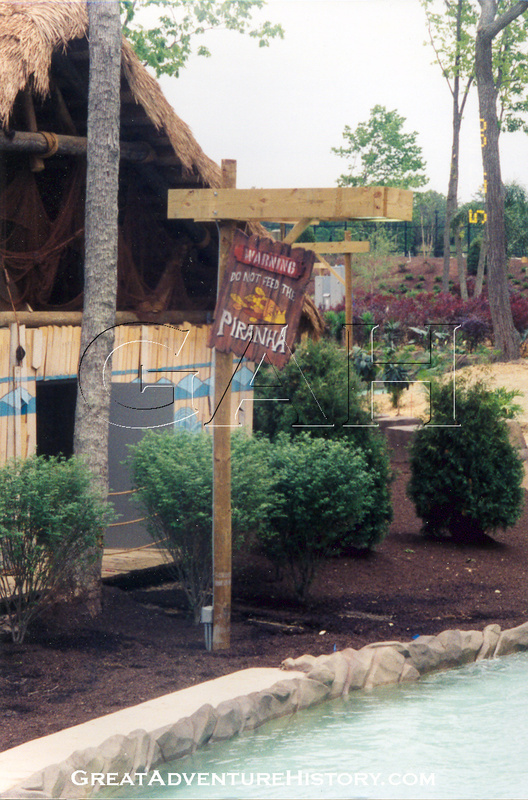 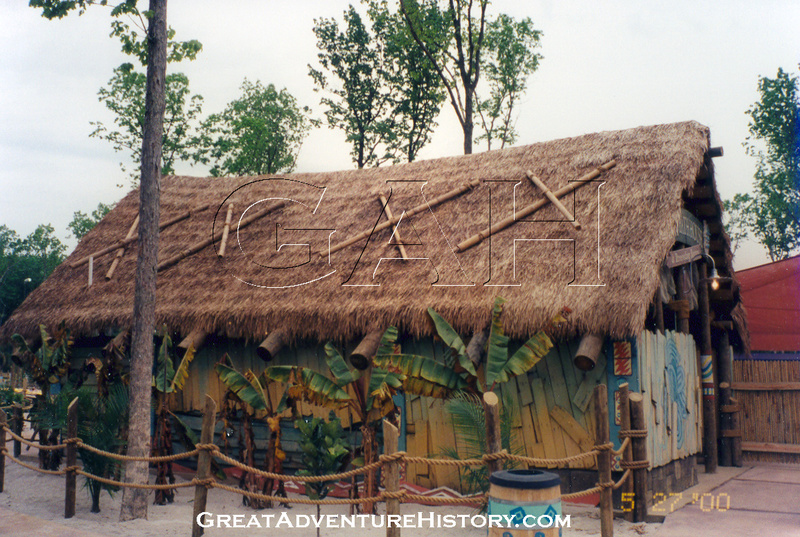 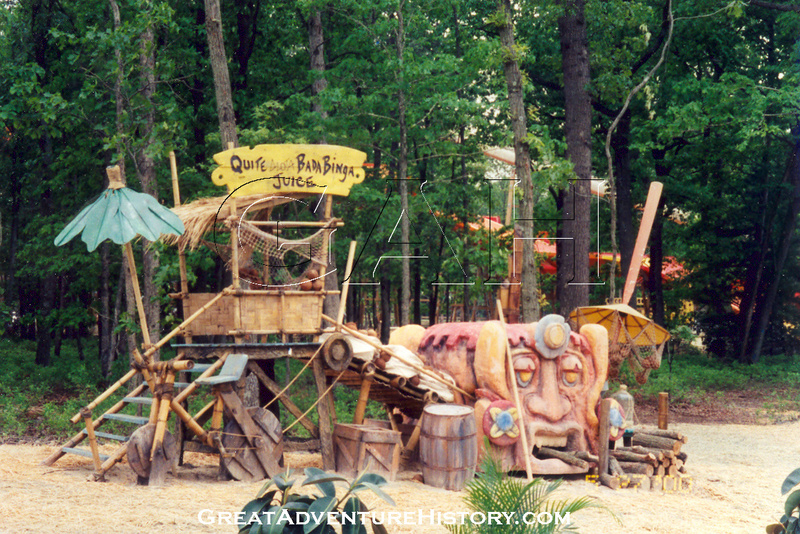 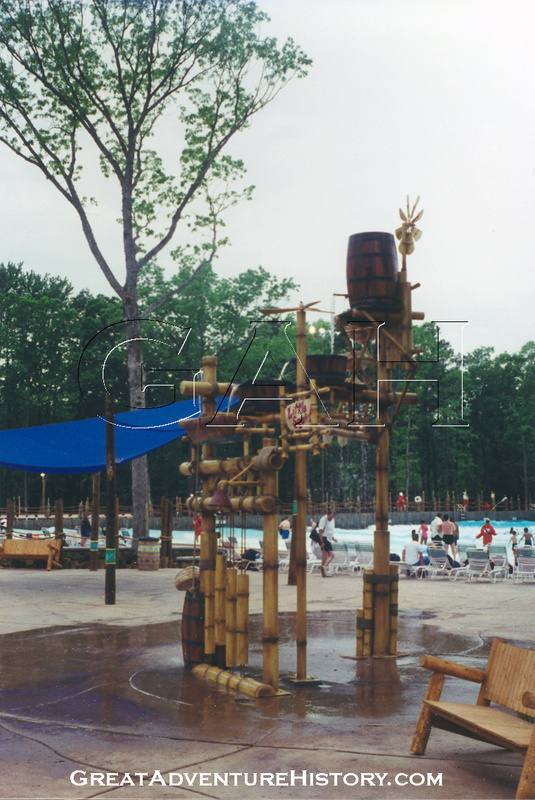 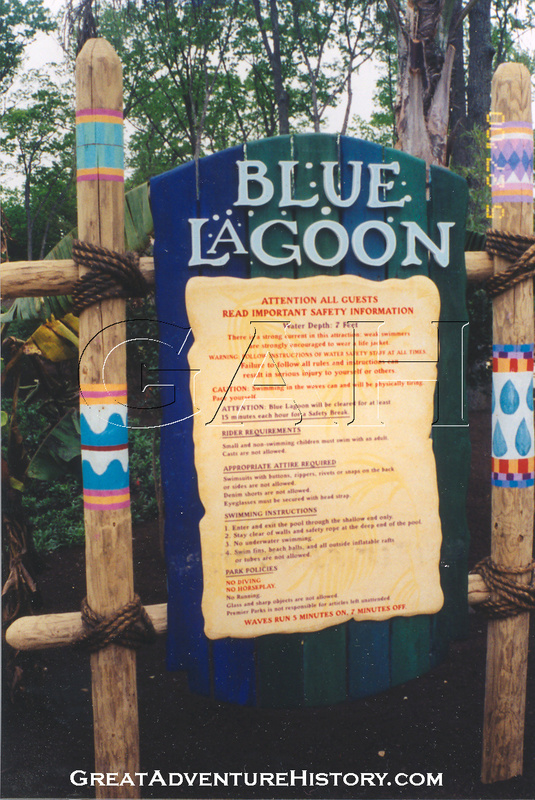 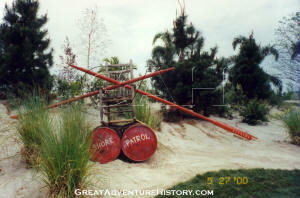 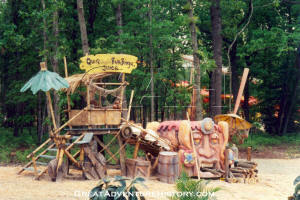 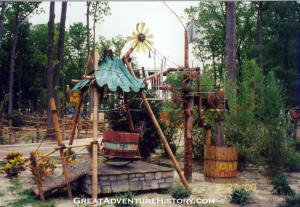 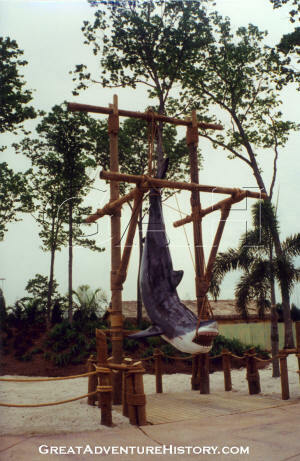 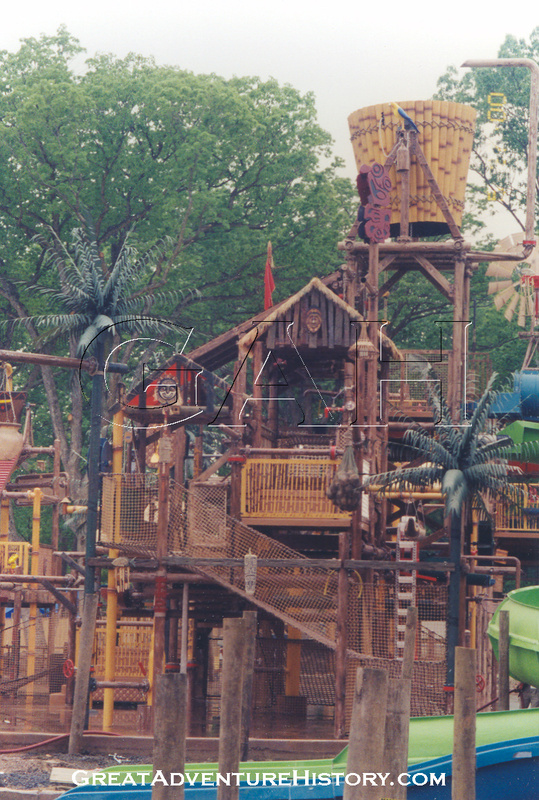 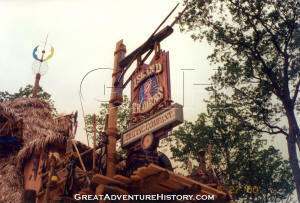 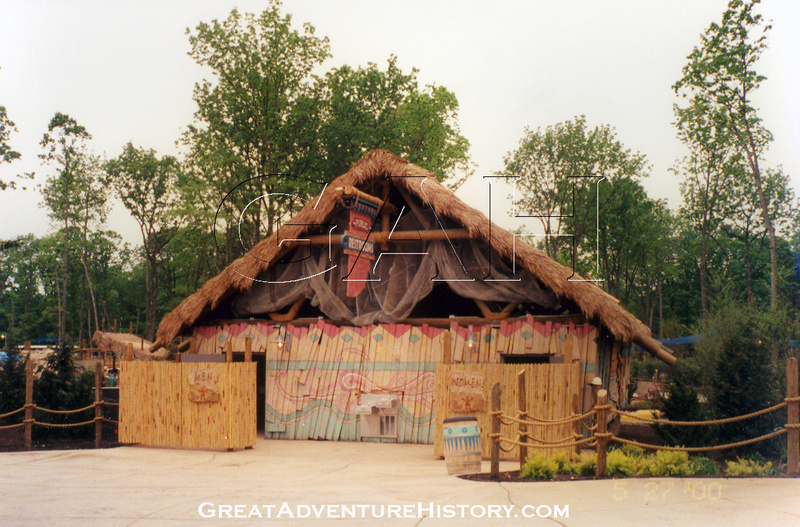 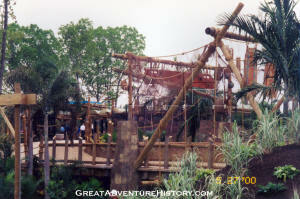 Some of the park's theme elements were in place but not yet complete as they had not yet been aged and weathered to complete their tropic island rustic look. Despite not being completely finished, the entry to Hurricane Harbor created an an impressively themed and immersive park experience. 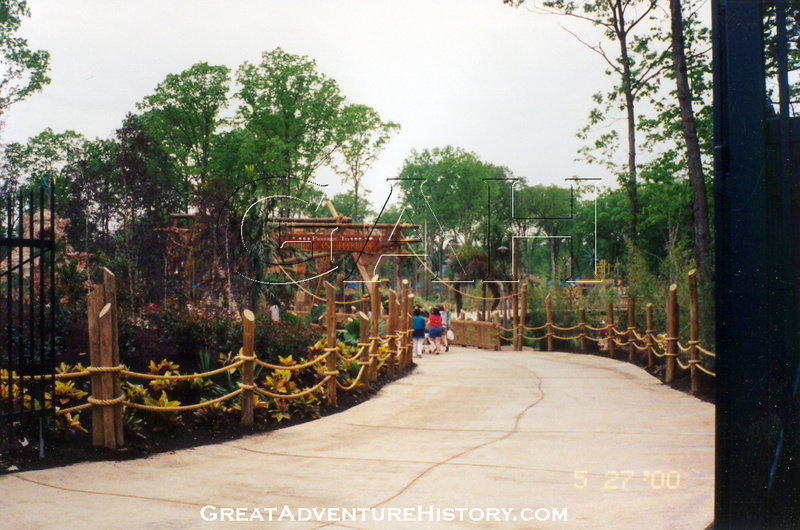 The winding path and berm separated the the entryway from the parking lot area. 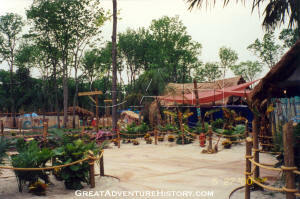 The scene was set with tropical foliage and elaborate landscaping and theme elements. 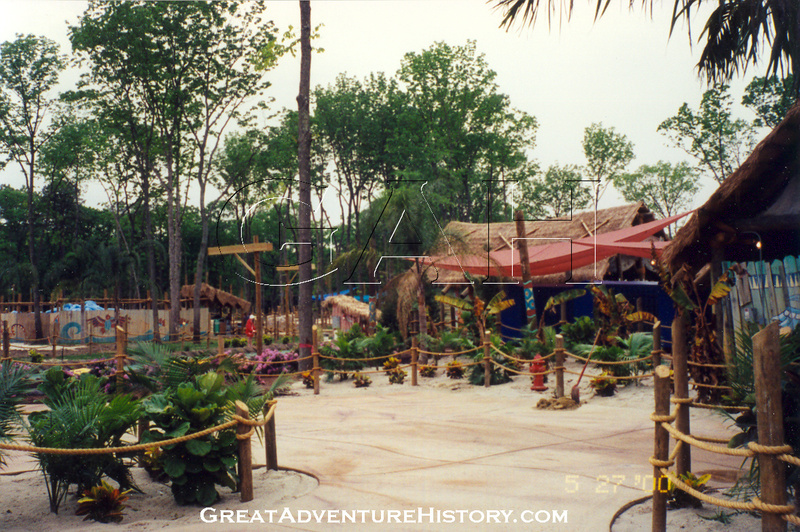 The lush, winding path from the parking lot to the park's front gate was the perfect transition into the tropical island theme, with the park's sound system providing tropical music to accompany the look of the buildings and other scenery. The overall theme of the park was generic "tropical island" blending elements of the Caribbean, Polynesia, and other colorful beachside locales. 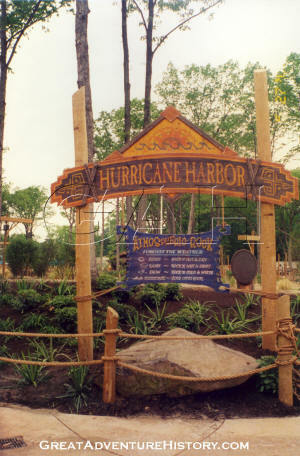 Along the way into the park a vignette featuring the "Tale of Hurricane Harbor", gave the backstory created specifically for the park, explaining how it was created and where the wacky inventions inside came from. 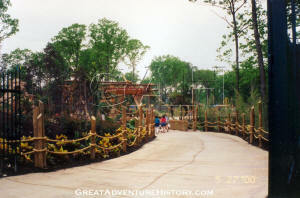 Entering the park required following a winding path, leading to a bridge onto the island at the center of the park. Everywhere you looked were colorful and exotic details. 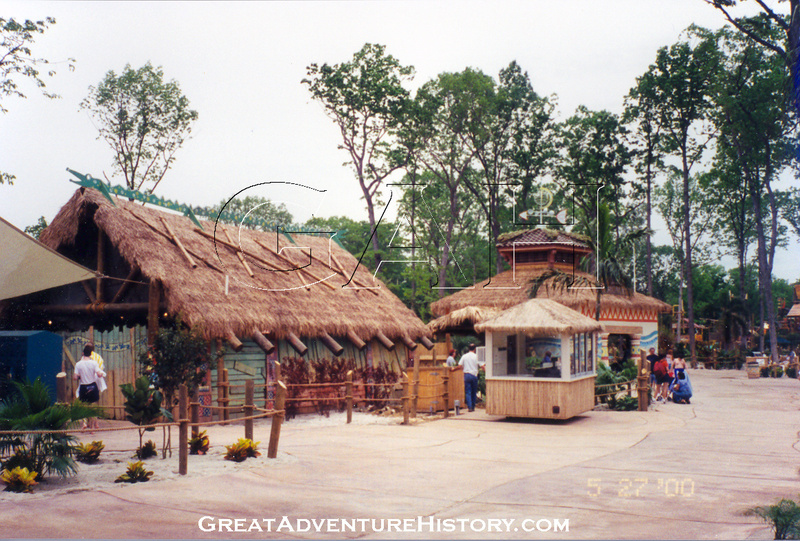 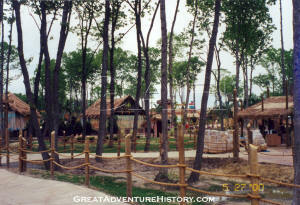 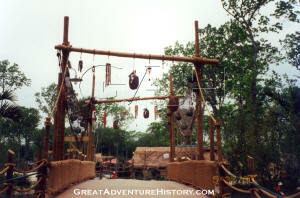 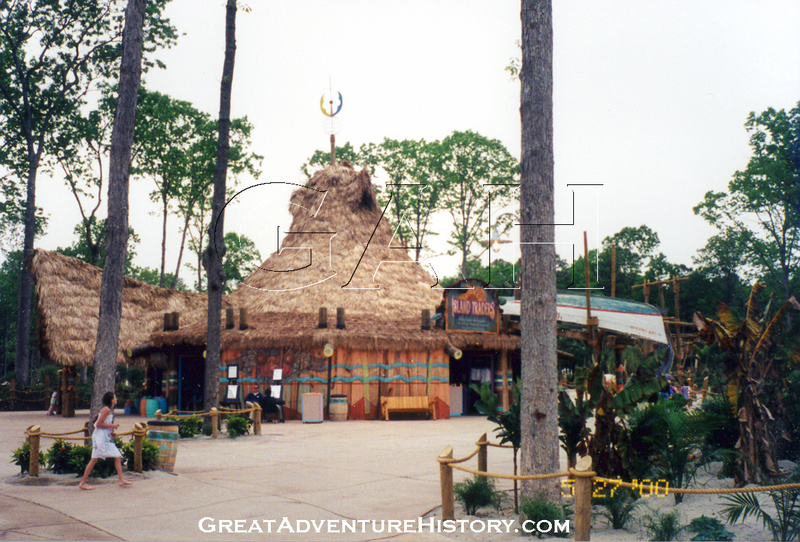 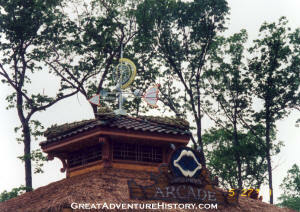 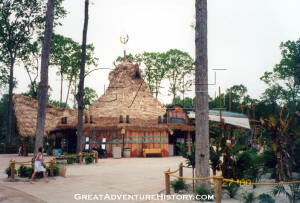 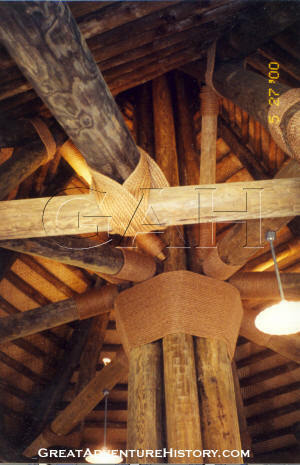 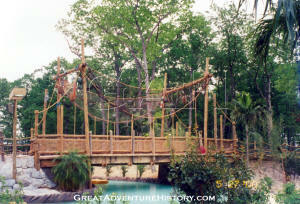 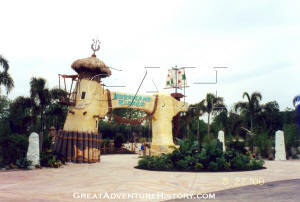 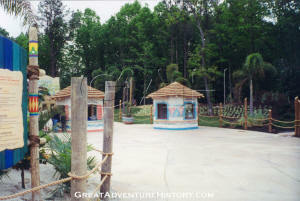 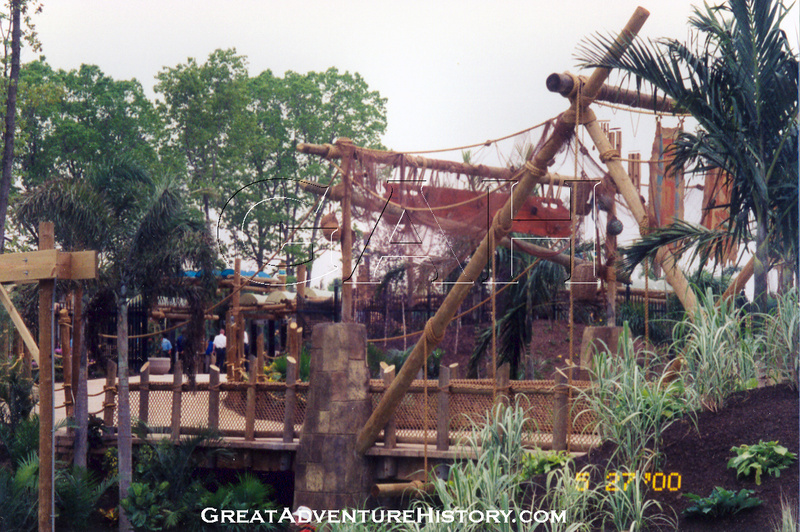 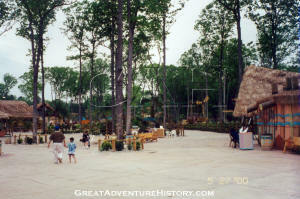 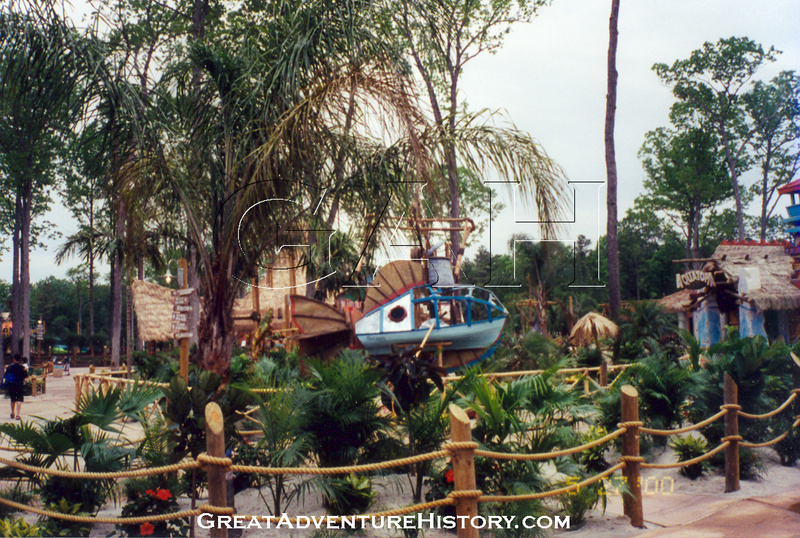 Bamboo, thatch, ropes and lots of nautical elements dressed the buildings, fences, bridges and the landscaping. The island created by the Taak It Ee Zee Creek would be home to the "Village" which is the heart of the park. The Village featured the park's guest facilities like restrooms, changing rooms, lockers, shops, and restaurants. 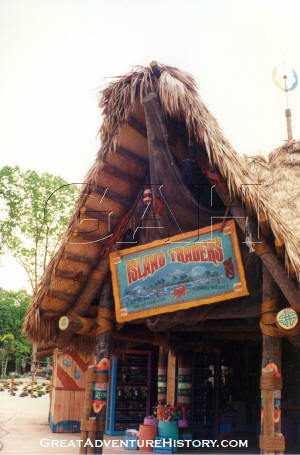 Island Traders was the main shop, offering all the essential supplies for a day in the sunshine and water. 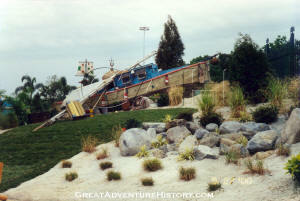 The building featured an array of oddly angled roofs, including an overturned boat as part of the entry way. 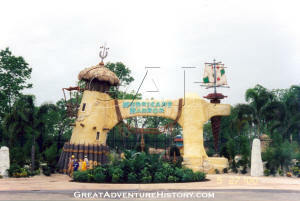 The colorful Aquatopia restaurant was the largest building on the island and offered a full range of food and snacks for the guests. 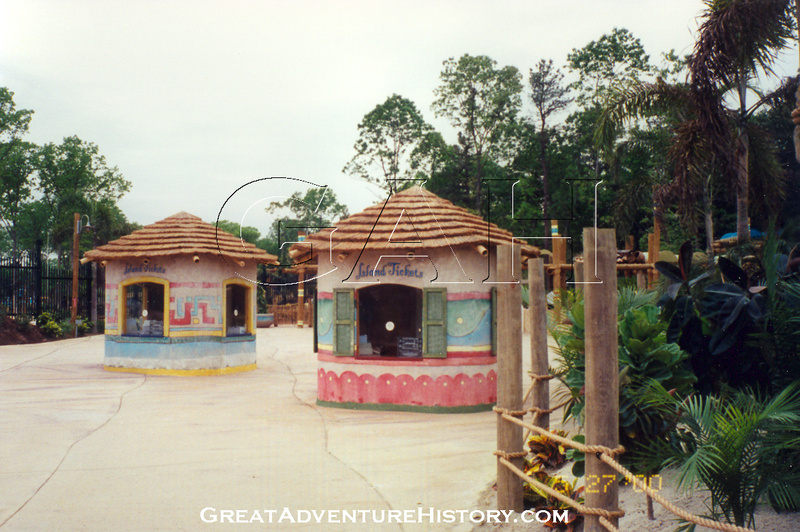 Two sets of changing facilities, lockers and restrooms at opposite sides of the island provided the facilities for the thousands of guests who visit the park each day. 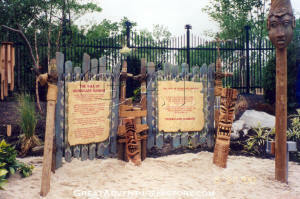 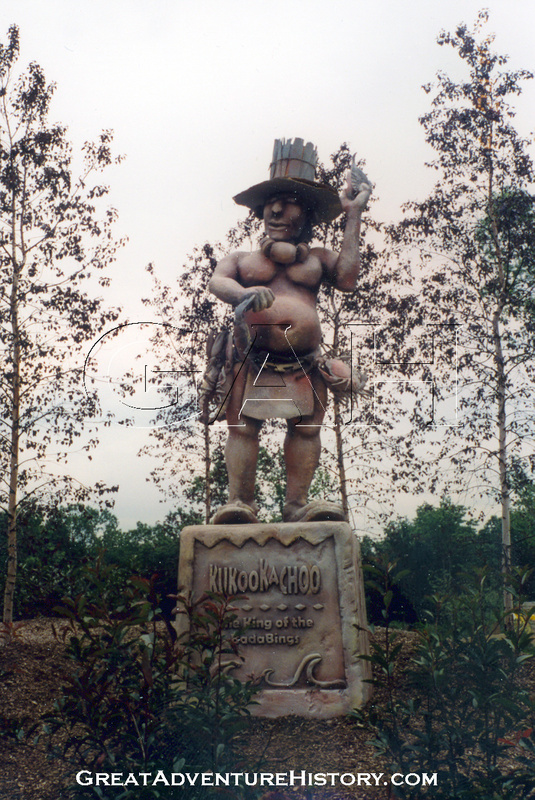 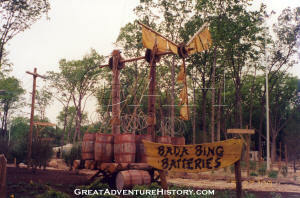 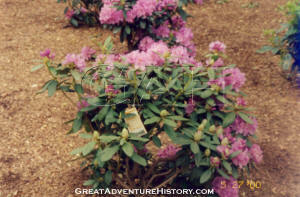 All around the island and throughout the park were interesting theme elements which were the "inventions" of the inhabitants. These elaborate displays were a blending of technology and primitive, merging rustic materials with a great sense of humor. Just across from the island, additional facilities including a second restaurant, a tube rental facility and a large white-sand volleyball court area, which was also designed to serve as a beachside concert venue. 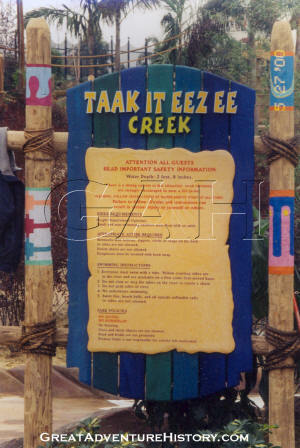 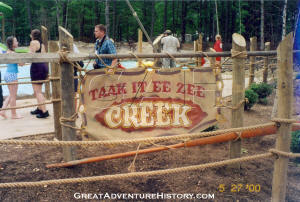 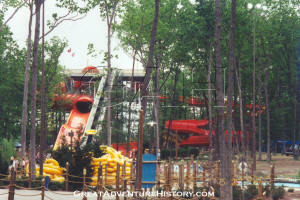 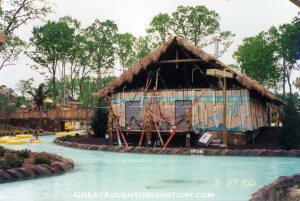 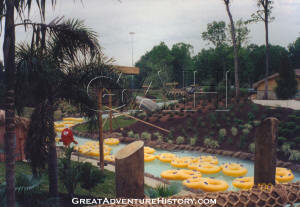 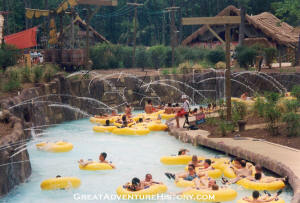 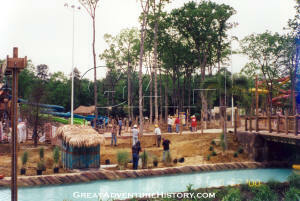 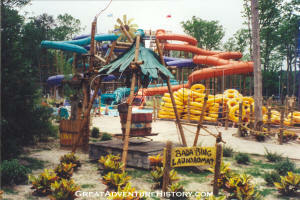 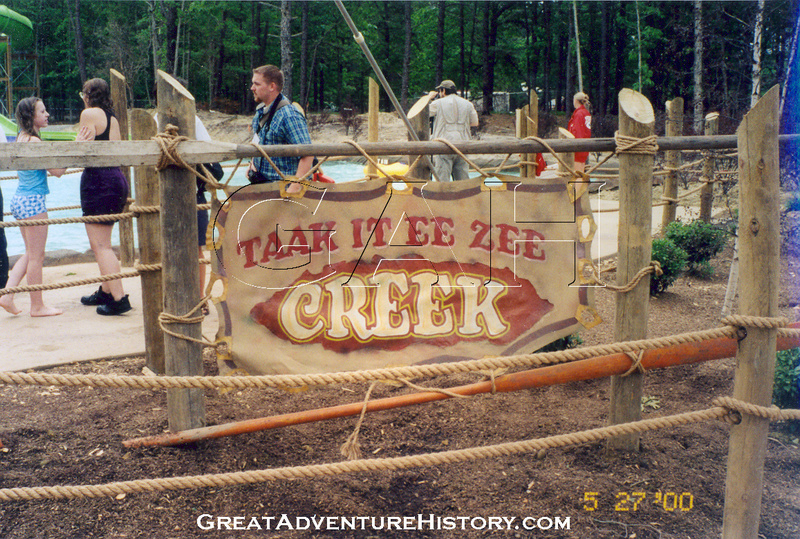 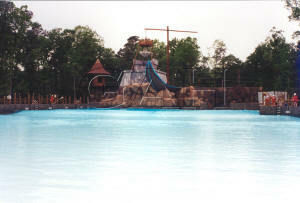 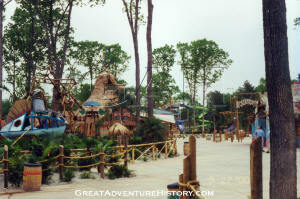 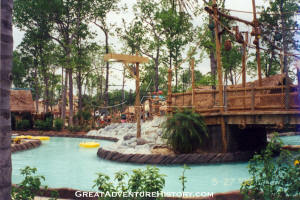 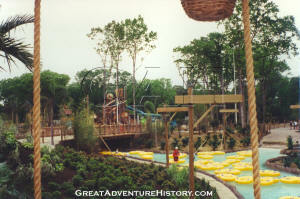 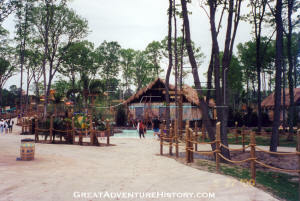 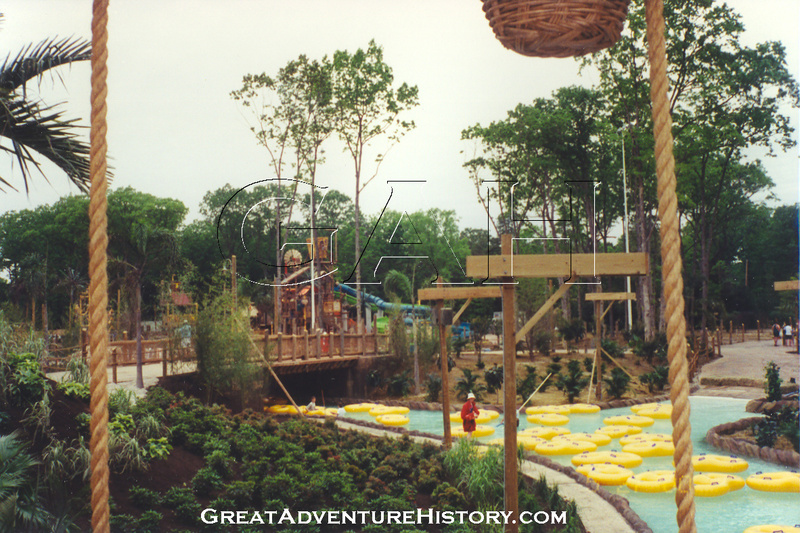 One of the most prominent features of Hurricane Harbor was the Taak It Ee Zee Creek, the park's lazy river. It was the largest lazy river in the world when Hurricane Harbor opened, which was fitting in the park that has been home to so many record holding attractions. 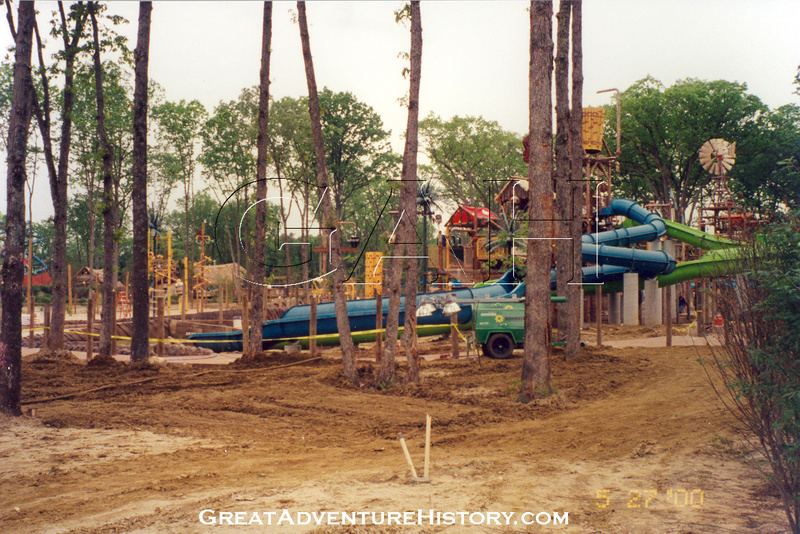 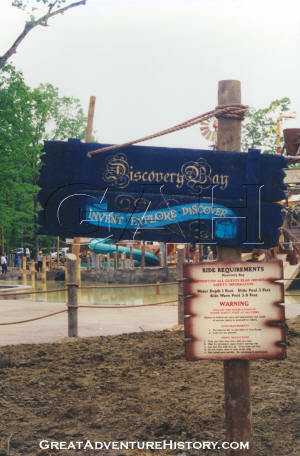 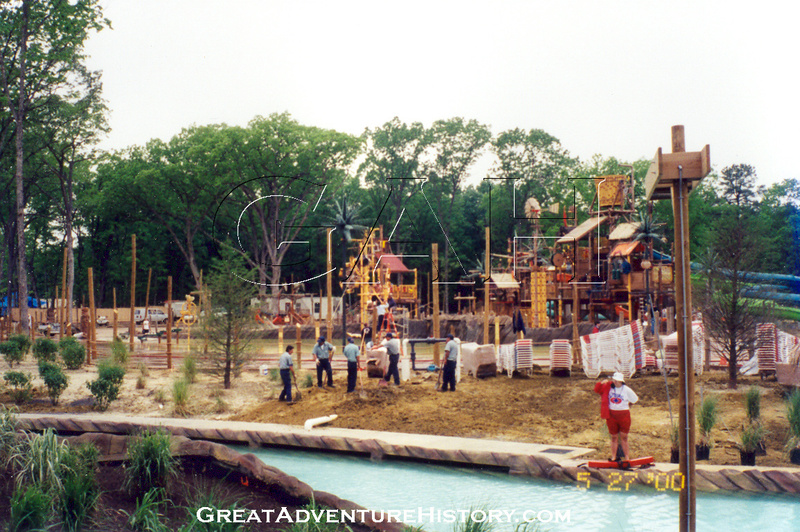 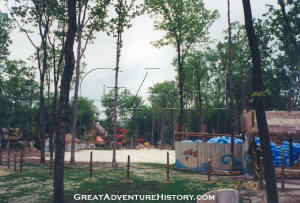 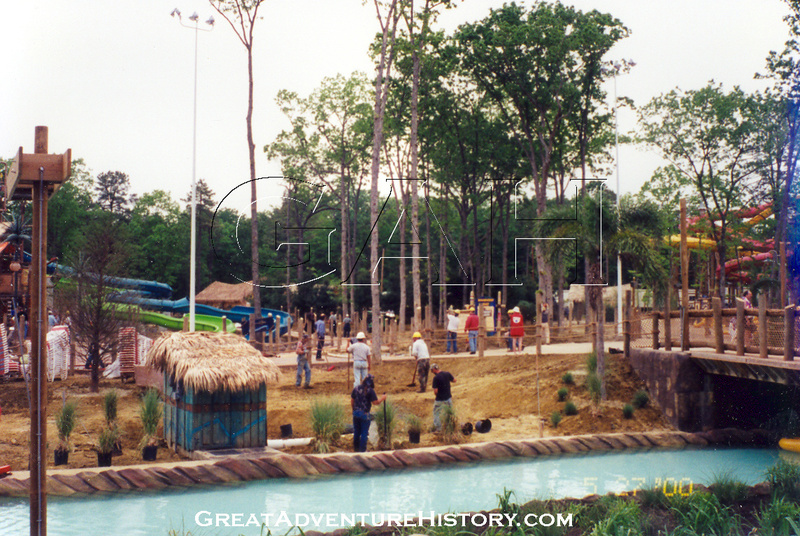 Though the lazy river was ready to open with the park, the surrounding area was very much a work in progress, with muddy banks being worked on by the construction team as the guests floated by. 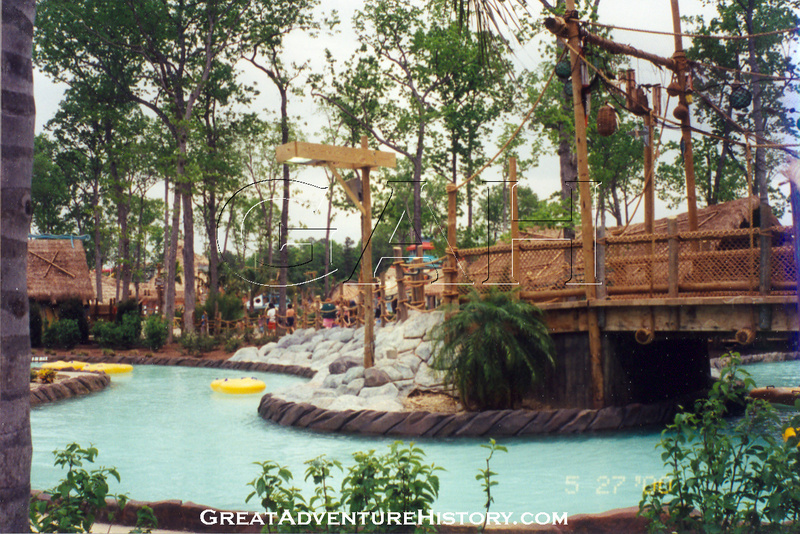 The lazy river wound its way around the island, past the buildings in the village and under the bridges to and from the island to the "mainland". At the far corner of the park was "the Winds" slide, which also opened with the park. 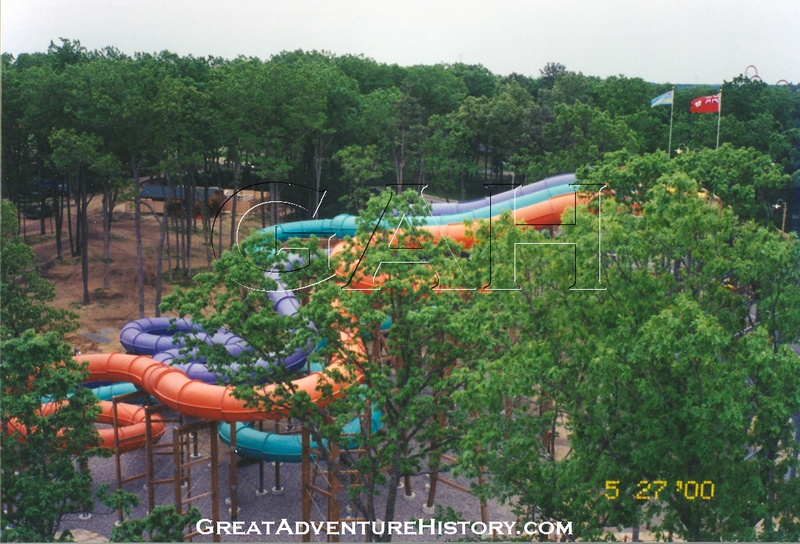 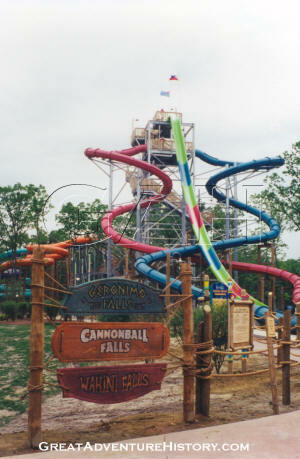 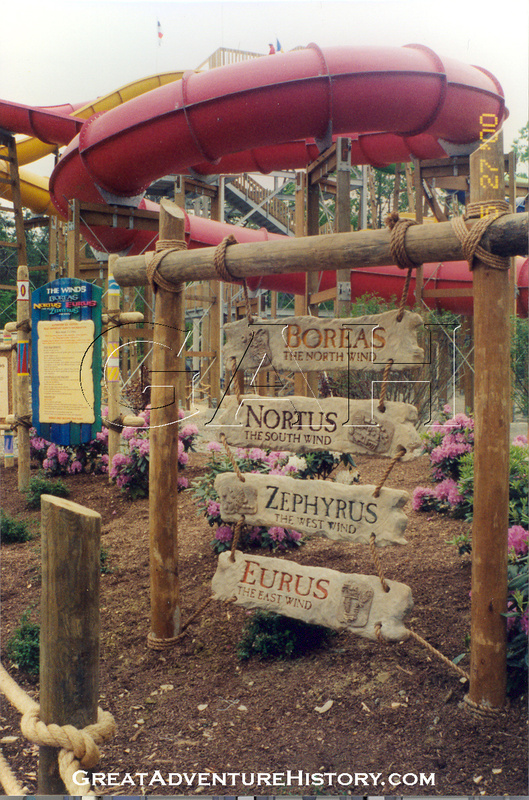 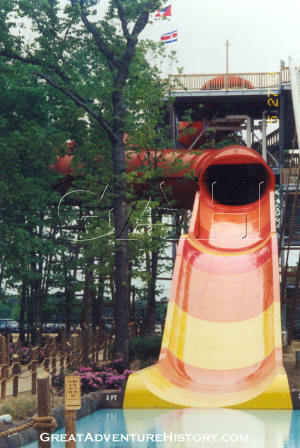 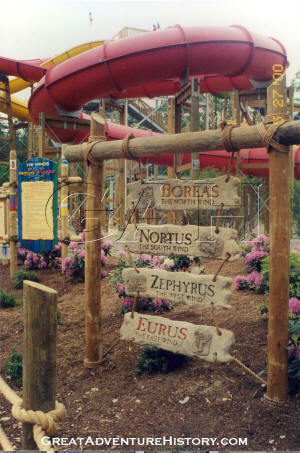 This four slide complex was billed as the "coaster slides" in the park, with each of the slides being named for the Four Winds. 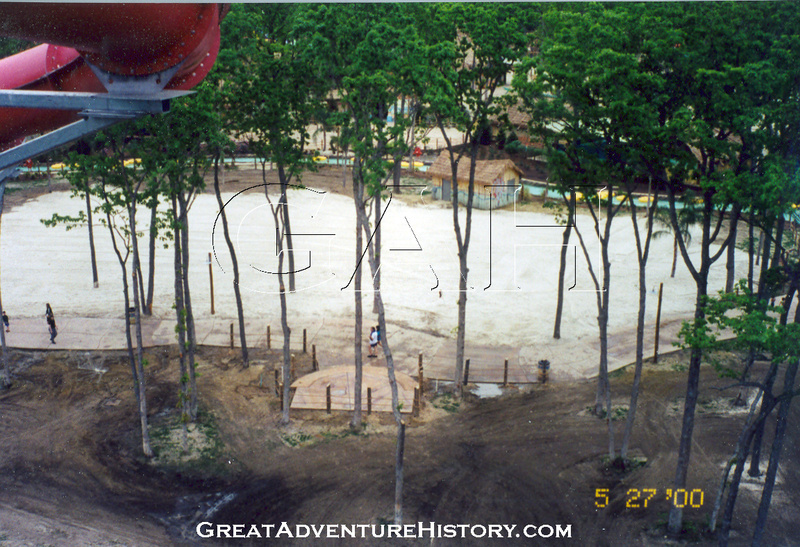 The area just beyond the slides was left with as many trees as possible, creating a buffer between the park and the adjoining property and road. 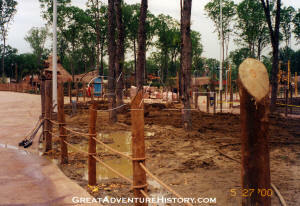 The edge of the wooded area was still lacking the finishing touches of landscaping on opening day, with bare sand piles and mud puddles just beyond the guest area. 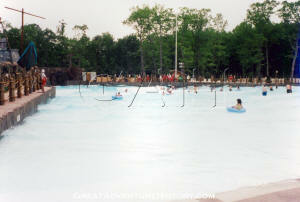 The Blue Lagoon wave pool also opened on Memorial Day weekend. 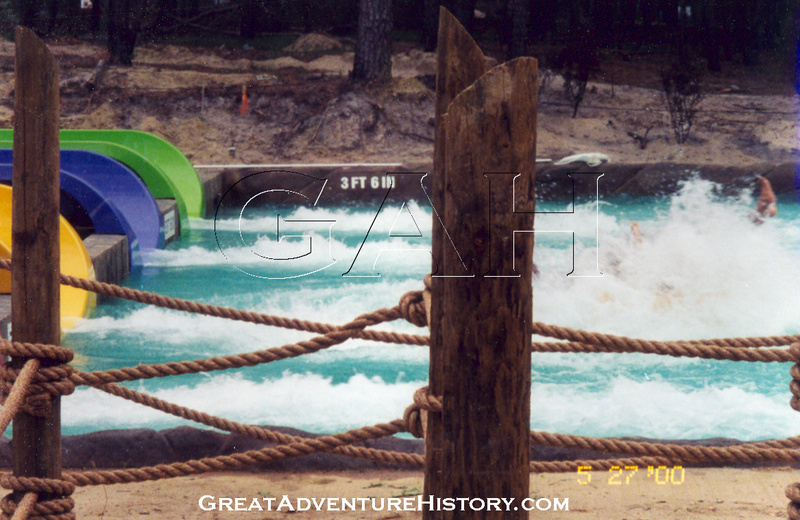 The huge pool welcomed its first guests despite the fact that the backdrop scenery covering the wave making machinery was still incomplete. 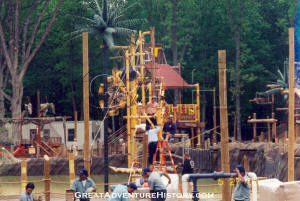 Workers were still climbing all over the backdrop still doing work on the scenery on opening day. 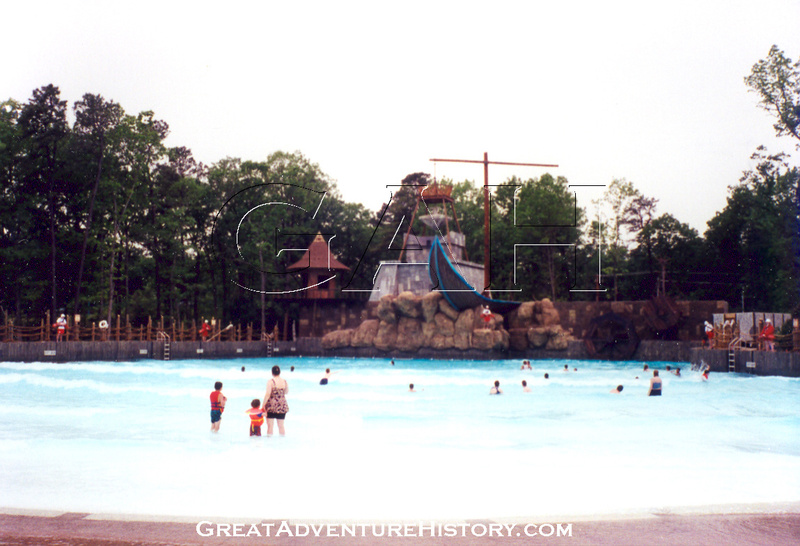 The cool, rainy weather of the preceding weeks made the large wave pool one of the chillier attractions in the new park, and kept many guests away until the weather got warmer. 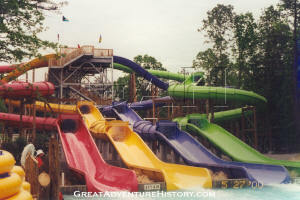 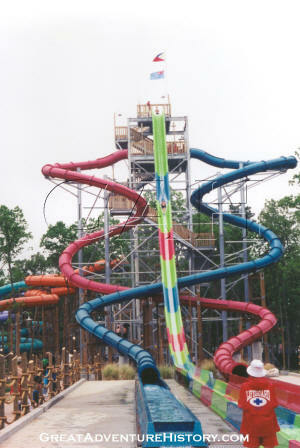 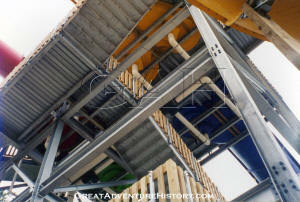 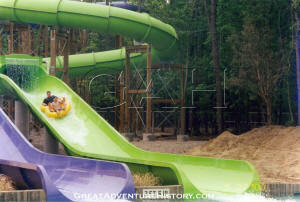 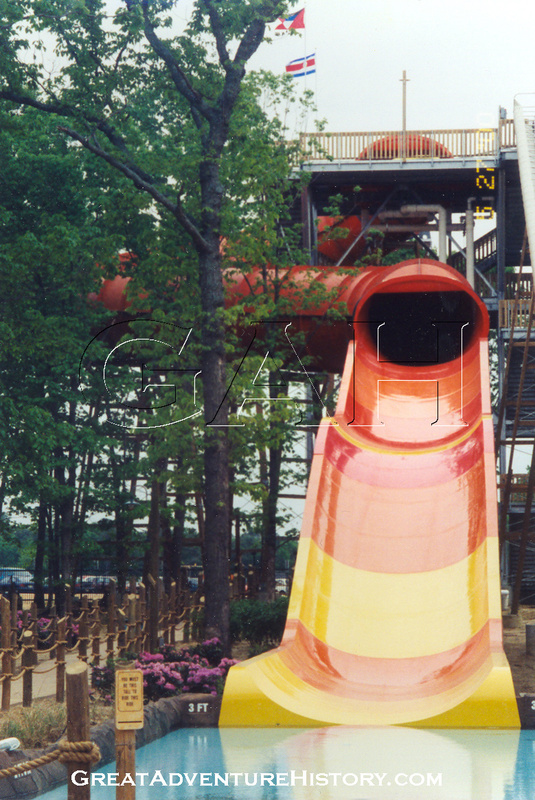 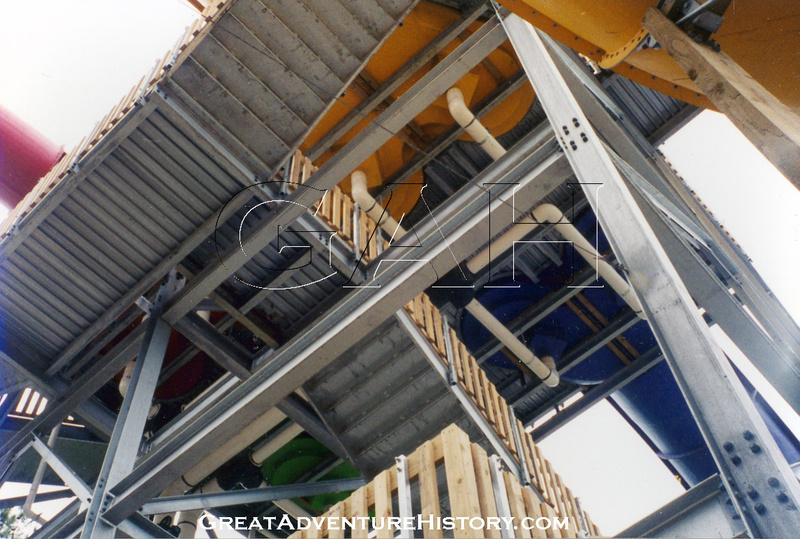 One of the most visually striking attractions at Hurricane Harbor was The Falls, the park's body slide complex. Being the tallest of the slide towers and the closest to the park entrance road the colorful twists were a visual draw to the farthest reach of the park. 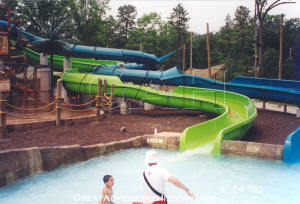 The open slide design of the central Geronimo Falls makes it one of the most thrilling attractions for both riders and the spectators who gathered on the walkway that ran parallel to the slide run outs. 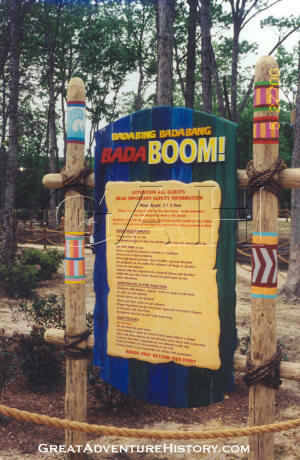 Bada Bing, Bada Bang, Bada Boom offered an additional three tube slides. 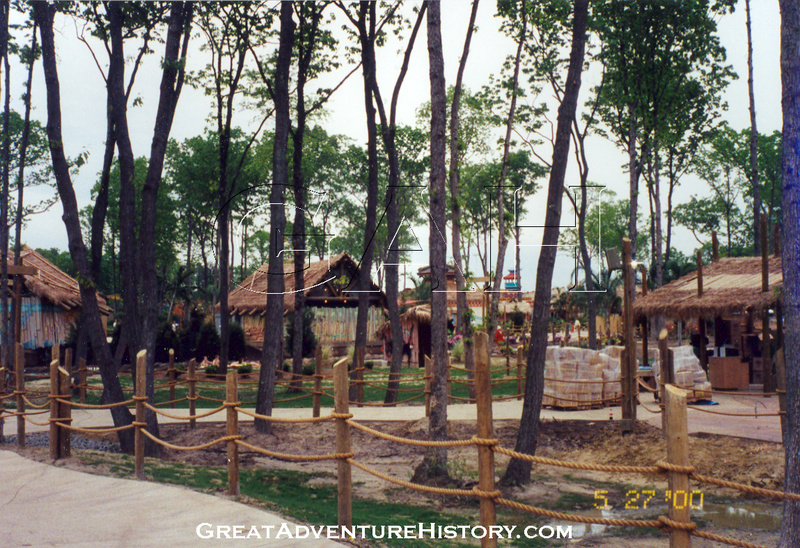 Set among the trees, it opened with the park Memorial Day Weekend, though it lacked the final landscaping touches on opening day. 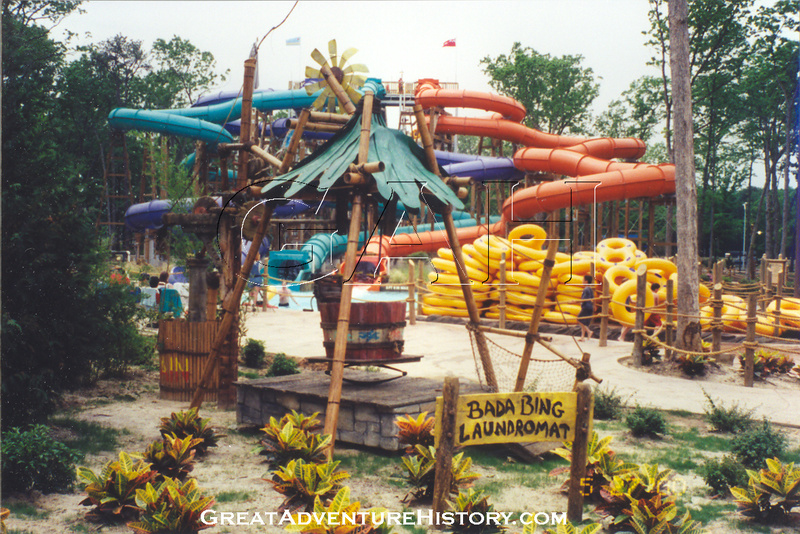 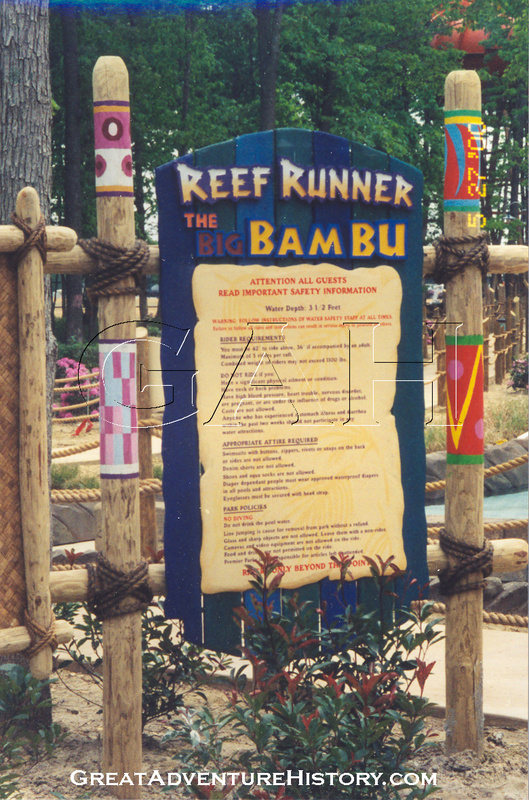 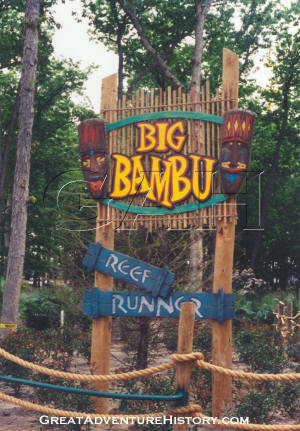 The Big Bambu and Reef Runner family raft slides weren't quite ready for opening day, with some of the giant rafts inflated and ready, but others still in the shipping boxes from the manufacturer. 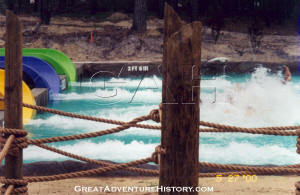 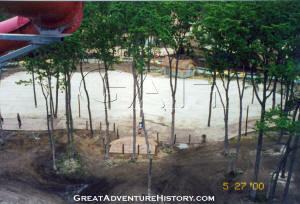 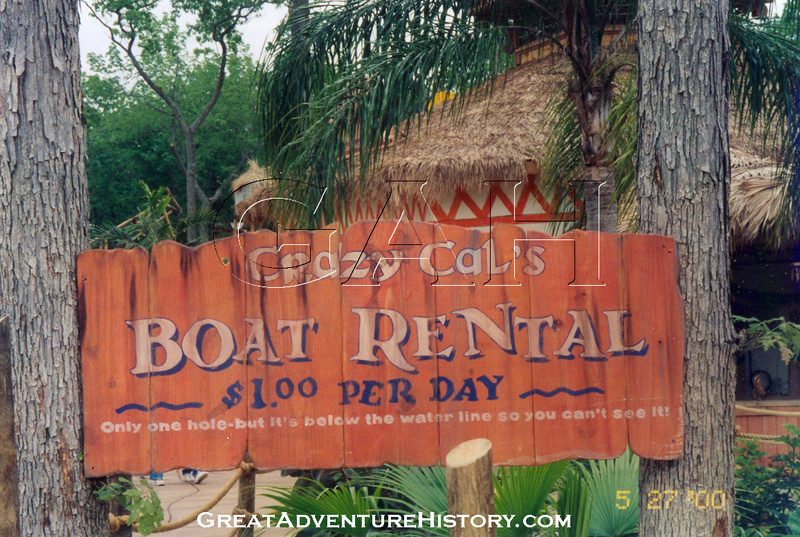 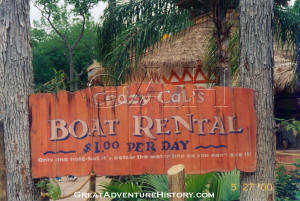 The rafts would open within a few days of the park opening. The landscaping of sections of the park was definitely what was most behind schedule for the opening day, with mud puddles still filling large areas that would eventually become part of the tropical paradise. Another large unfinished project for opening weekend was the Discovery Bay area, which features the giant play structure and children's wading pools and play areas. 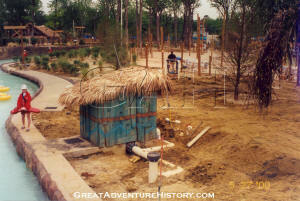 For opening day it appeared most of the structure was complete, though workers, machinery and equipment were still all around the area working to finish all the small parts and add the shade structures. Within a month of the opening of Hurricane Harbor, things really came together as the summer officially started. 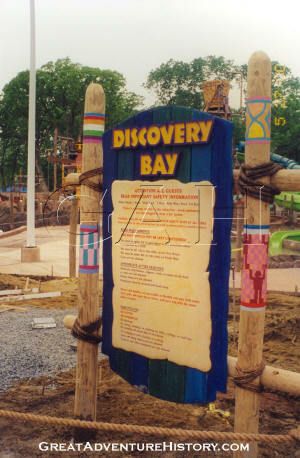 The Discovery Bay section was up and running, and the finishing touches missing from the landscaping and theme elements were all in place, giving the final tropical touches to the waterpark. The waterpark was a hit and drew large crowds all summer long.